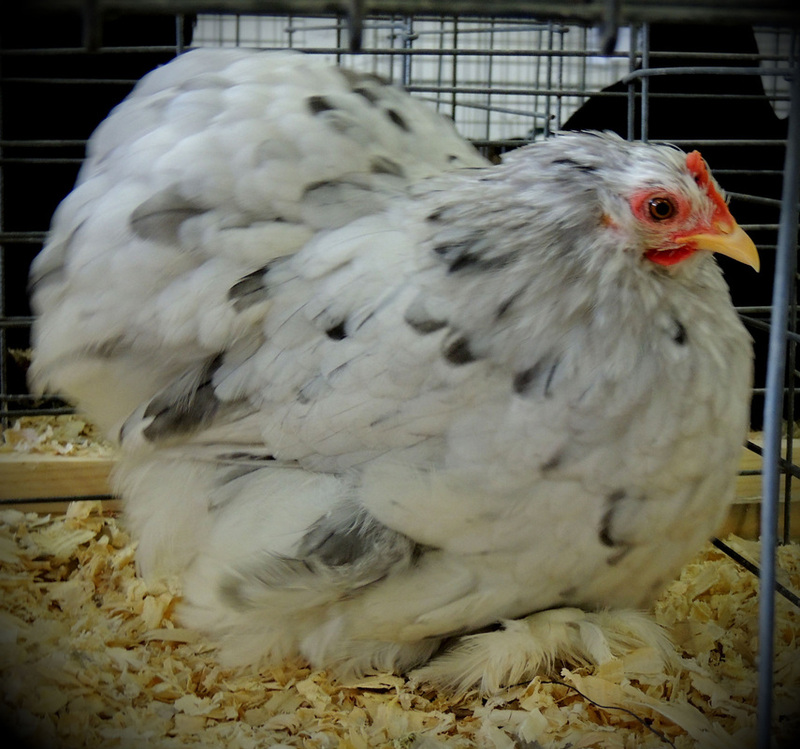 Entries for the Spring 2014 Show will be accepted beginning May 1, 2014. The ENTRY DEADLINE is Midnight, May 7, 2014 for both Entry Form (online) and Photo Submission (email). 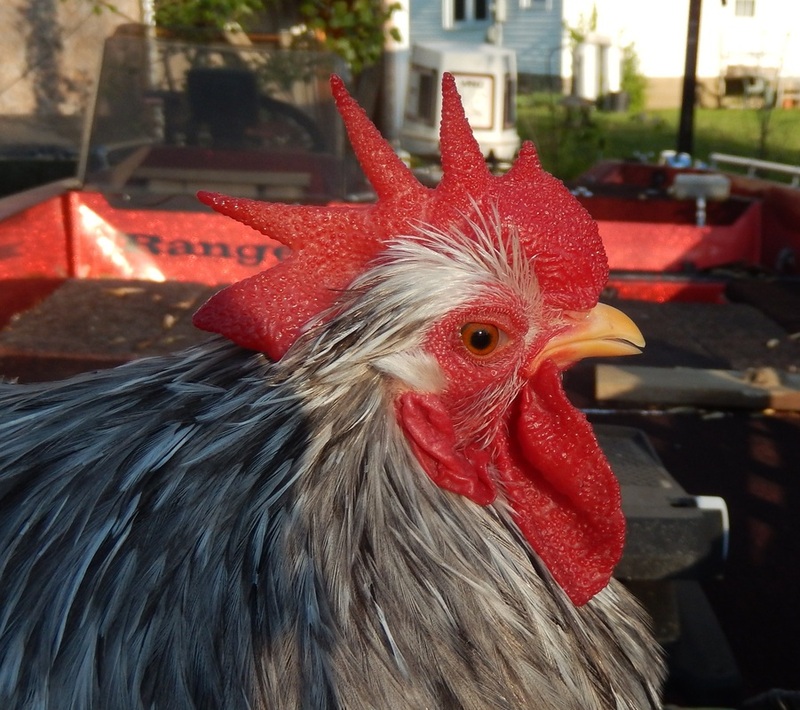 JUDGE for the Spring 2014 Show will be Marty McGuire. Photos of all entries will be posted below as they are received. As with normal show Coop Tags, Exhibitor's names will be not shown. Click on the first photo of each entry - it will enlarge and allow you to scroll through all six pictures. 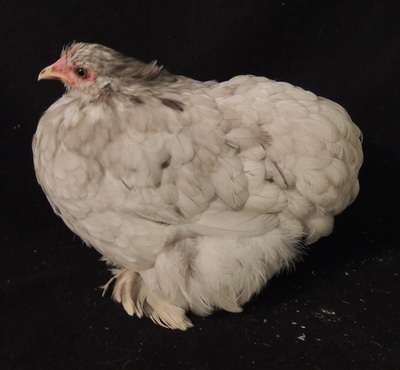 "I would like to thank Gail and the CI for their hard work and efforts to help with the education of both bantam and large fowl Cochins. 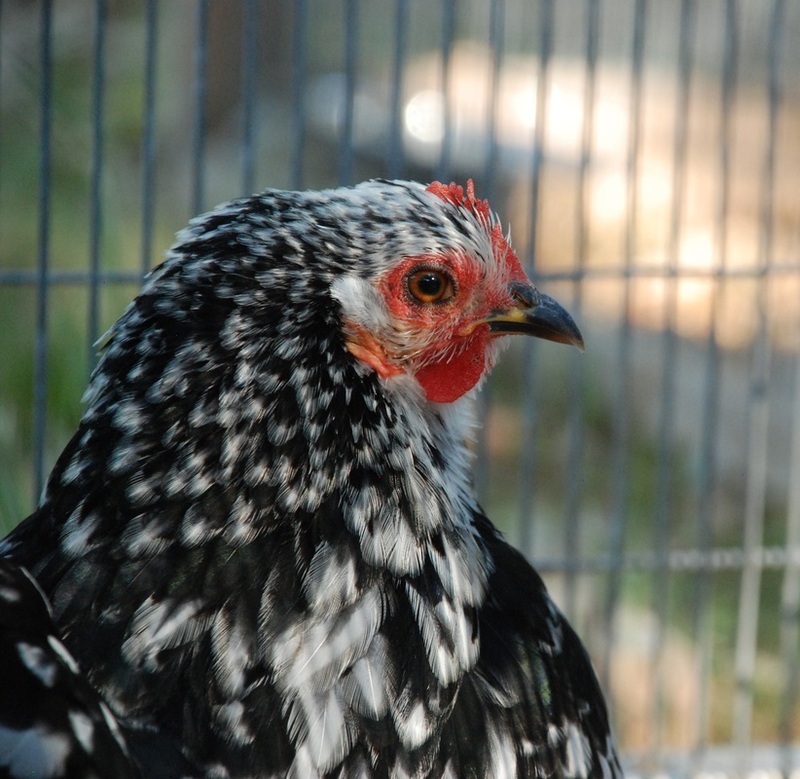 These On-Line Shows are a great way for the beginner, either exhibition or backyard breeders to learn and preserve the Cochin breed. 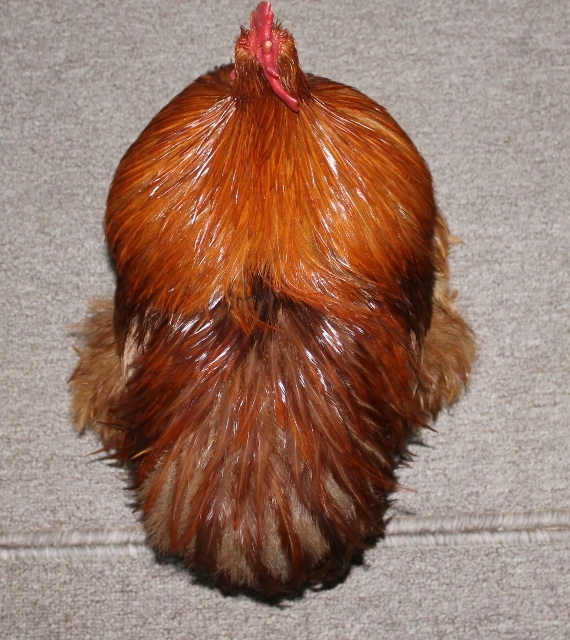 Everyone’s goal should be to breed and produce pure bred cochins and pure line varieties which breed true for color. 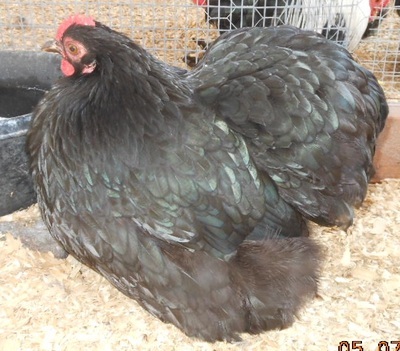 I want to thank Gail for asking me to judge and place the birds at this Spring 2014 On-Line Show. It was not only a way for me help those wanting to learn but also to help me to sharpen my skills as a judge. 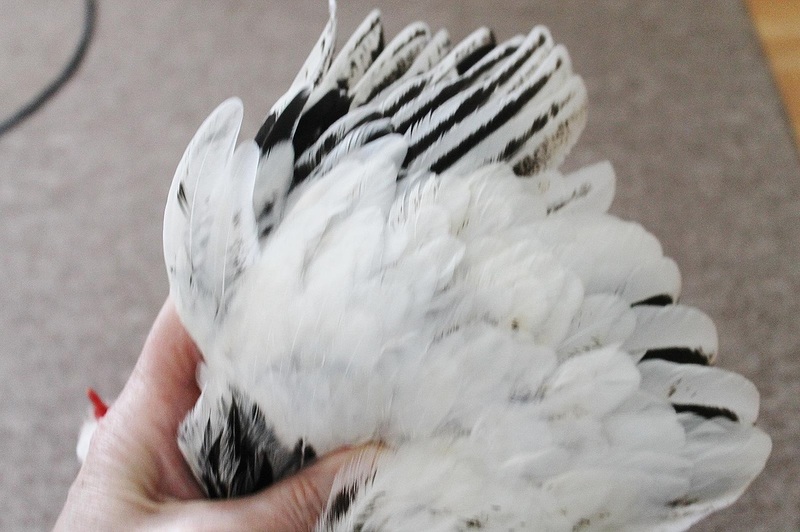 I want all those who exhibited to know how much I enjoyed seeing your birds and how grateful I am that you are taking part in the club learning activity. 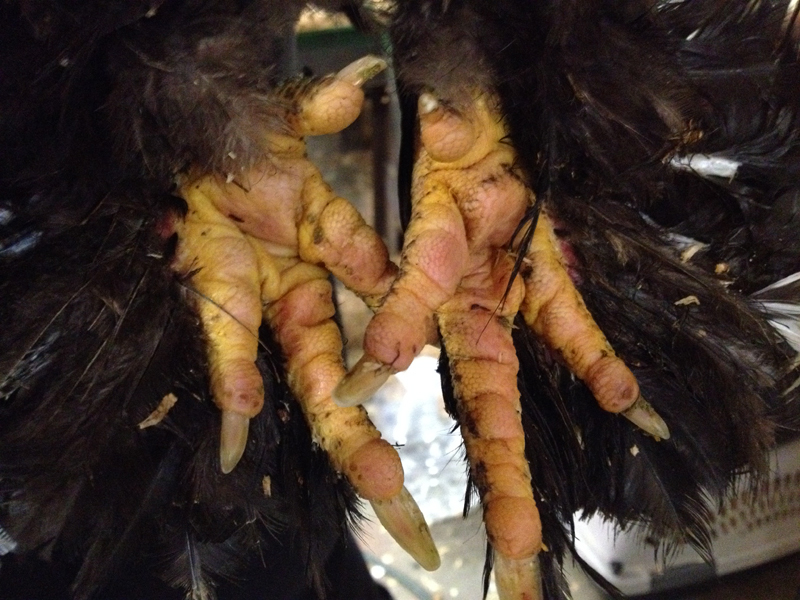 Here are a few notes about the birds that I hope will help you to understand about the judging. This time of year is hard on exhibiting birds, condition is worse due to egg production, breeding and climate. 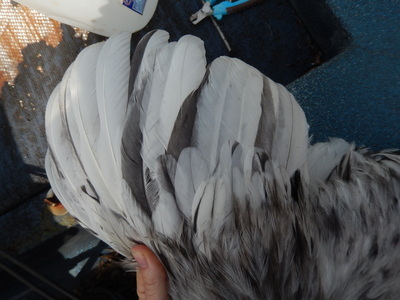 I notice in several of the female combs were up, had a twist, ear lobes were light, pale or appeared to be white, feet color white or lack of yellow. All of this is contributed to egg production. 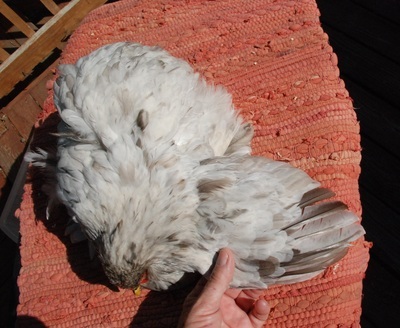 All of these things as a judge I tend to cut lightly this time of year but hit harder in the months when these things should not show. 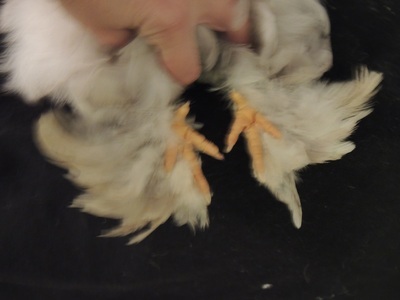 However when making the final cuts and decision you have to account for these as defects. 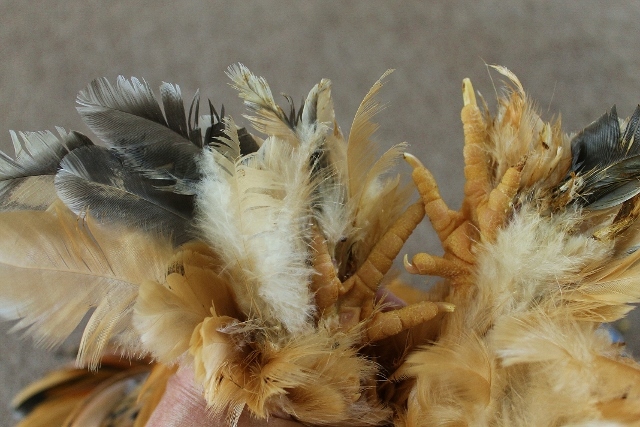 The clear winner is and should be the bird with the fewest defects. 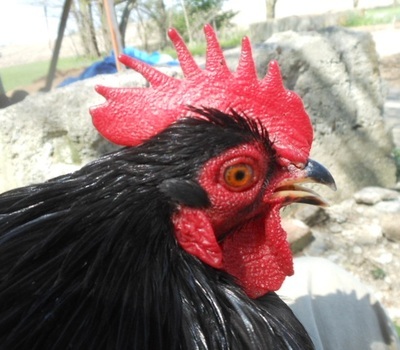 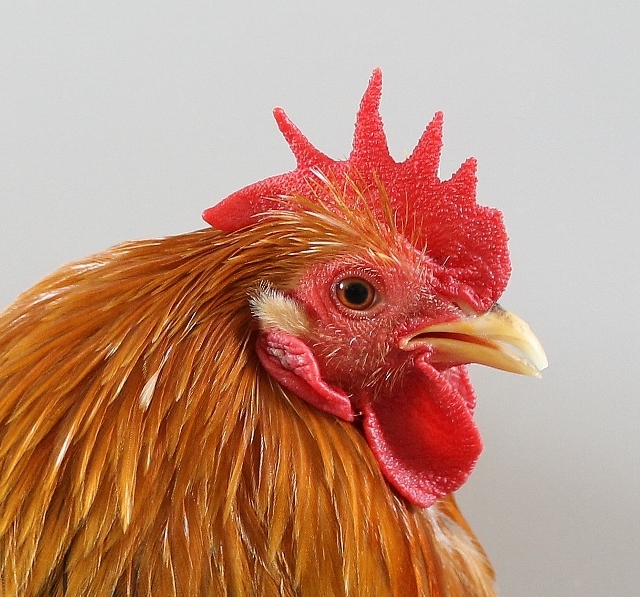 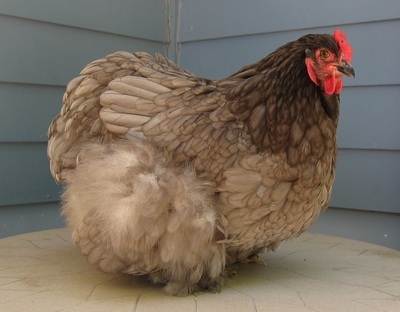 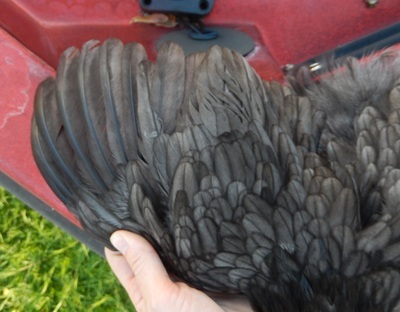 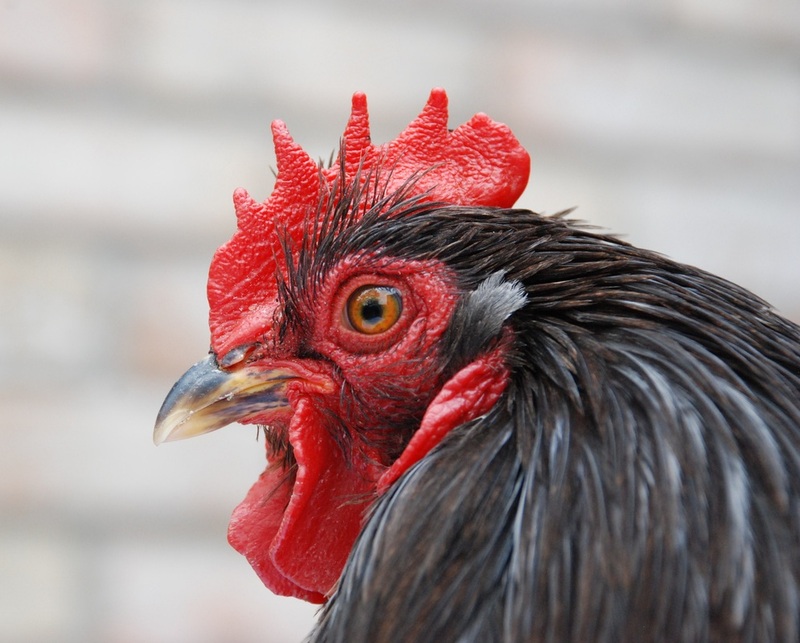 Also on the Blue Variety, I saw much brassiness in the head, neck, hackle and saddle feathers in both bantams and large fowl, this to can be contributed to several things as well as breeding. 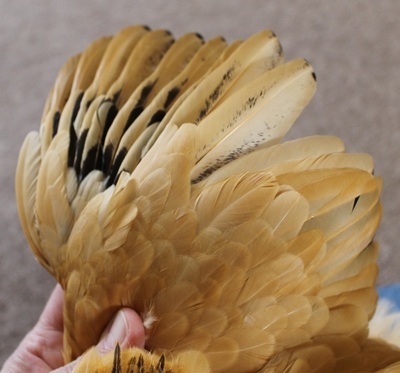 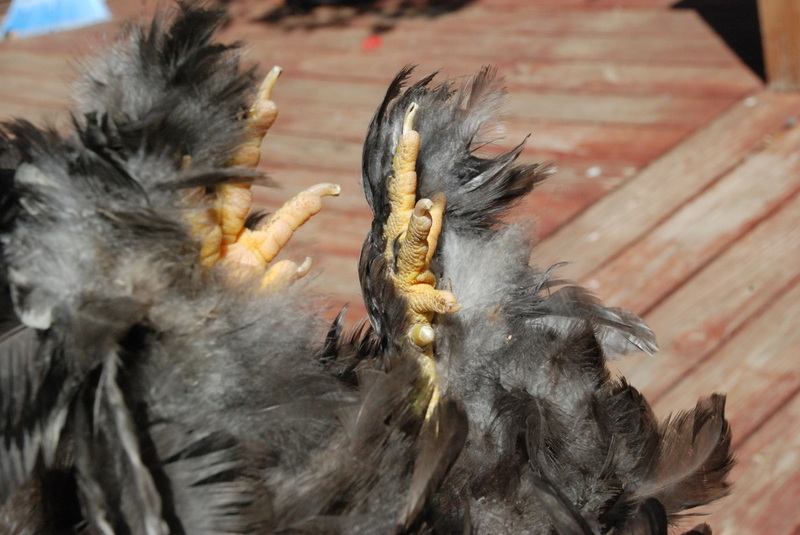 The brassiness or red feathering can be a breeding defect in the color but it also can be the result old feathers need to be molted out or from being in the sun. 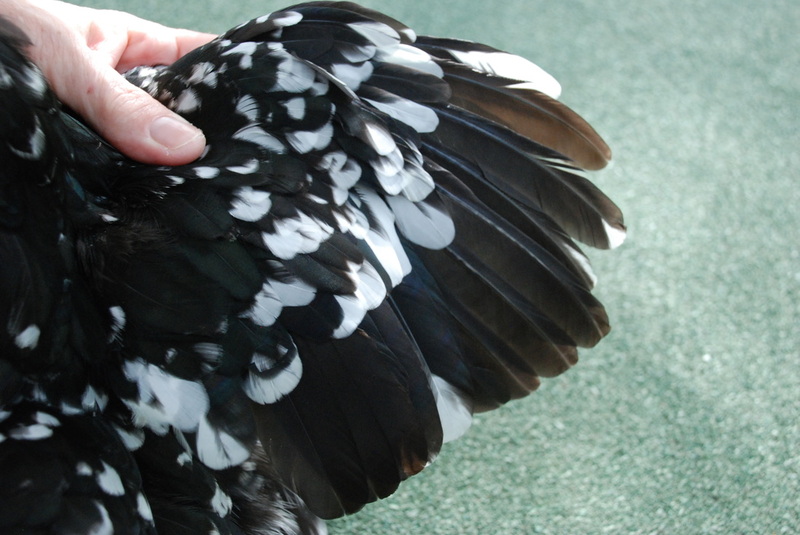 The Blue variety will sun burn and turn the feathers in areas of the bird. 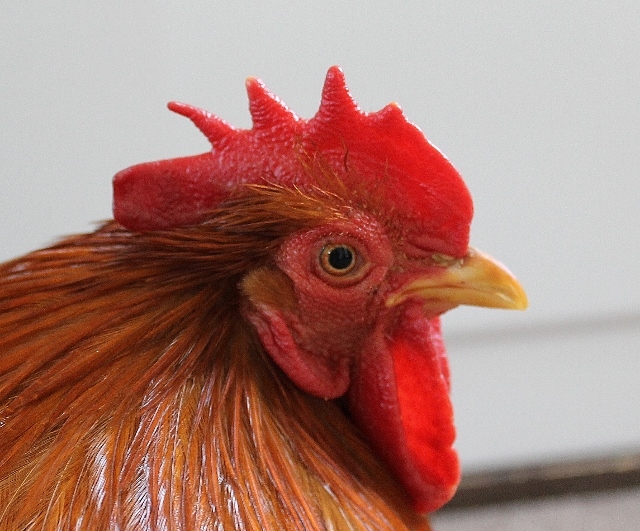 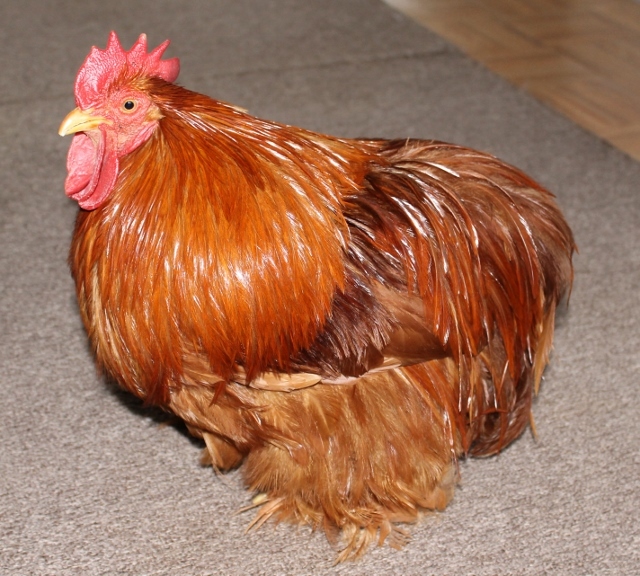 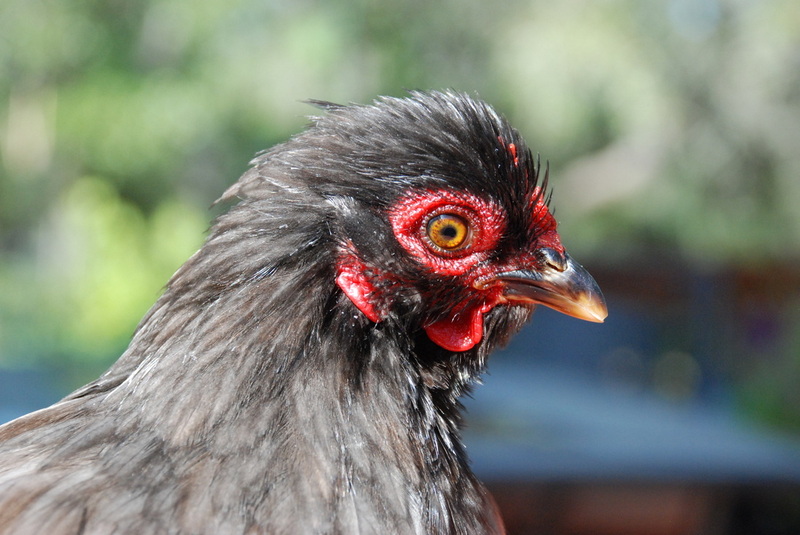 Brassiness or red feathering can be a disqualifying factor in the show ring. One other thing to watch is your pictures; it’s sometimes hard to judge with a good picture but one that is blurry makes it even harder. 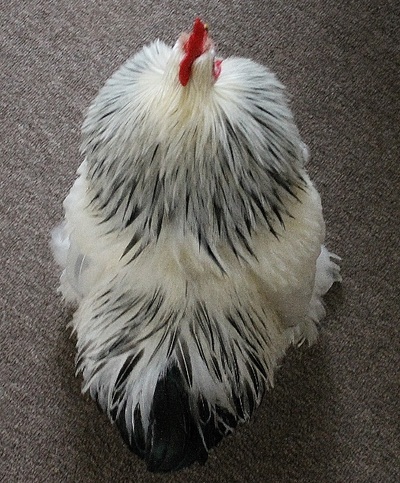 I know trying to make pictures of you birds is very trying and they do have a mind of their own but good pictures with good possess will enable the judge to give you a better assessment of the birds. 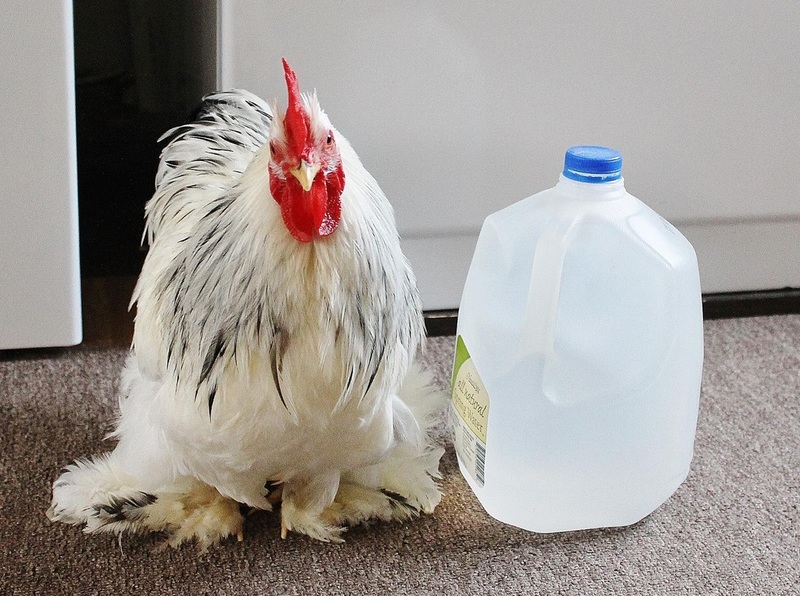 Over all I would like to say a job well done and thanks to everyone." 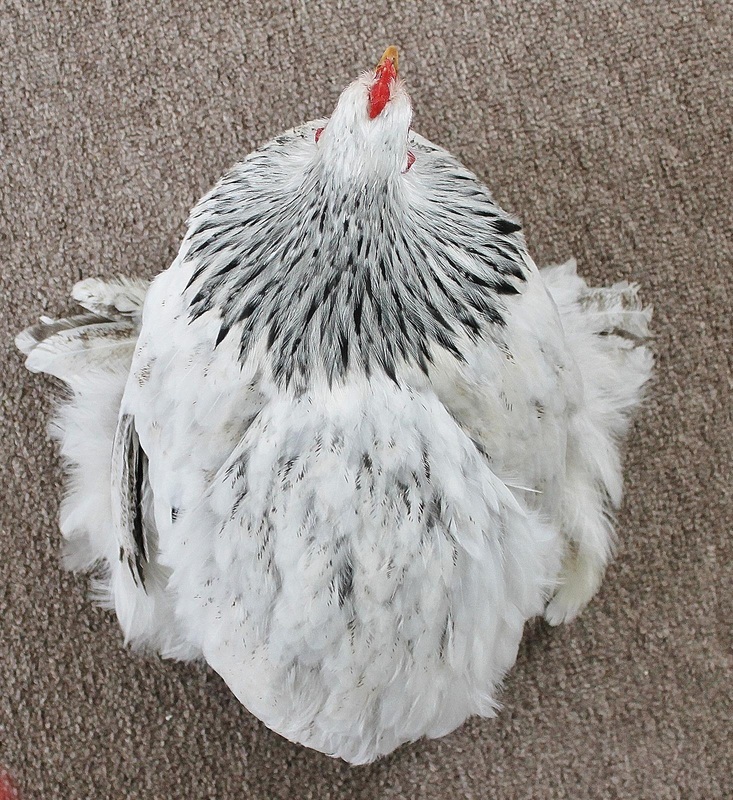 "The overall type and balance is very good, nice breast and cushion. The head has nice width and roundness to the face, comb sets well on head, nice size and shape. The wings a strong, full feather when spread, closes tight and held very well in position. Eye and feet color very good. I would to see a little forward tilt but a very good overall Cochin." 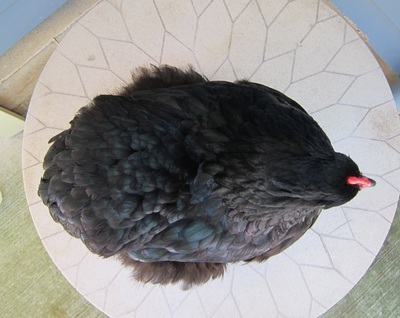 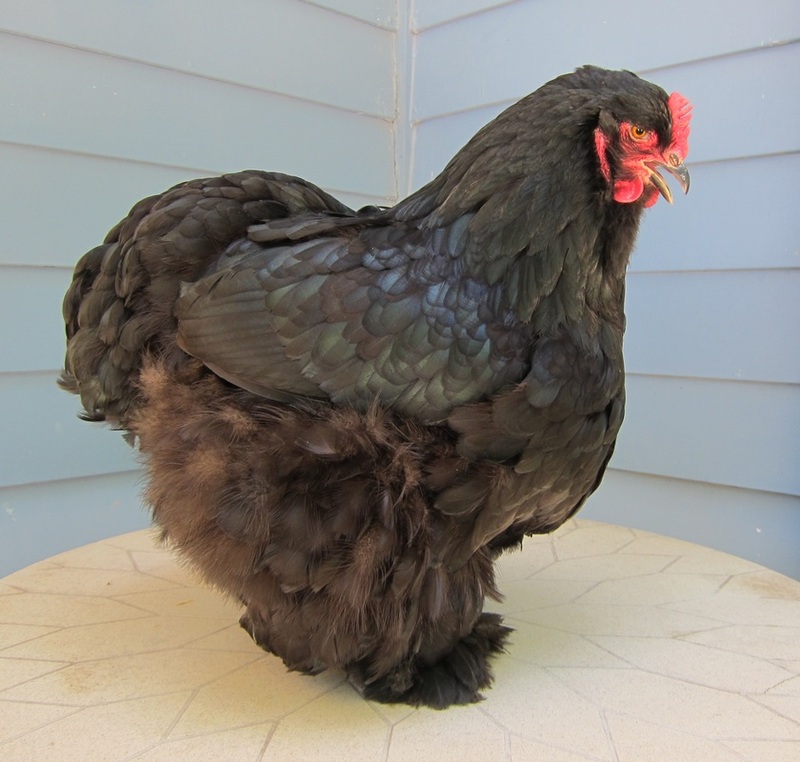 "Type, width and roundness is good, condition is rough and out of feather in main tail. Comb is missing 1 spike, eye and feet color is good, and wings are strong and carried well. 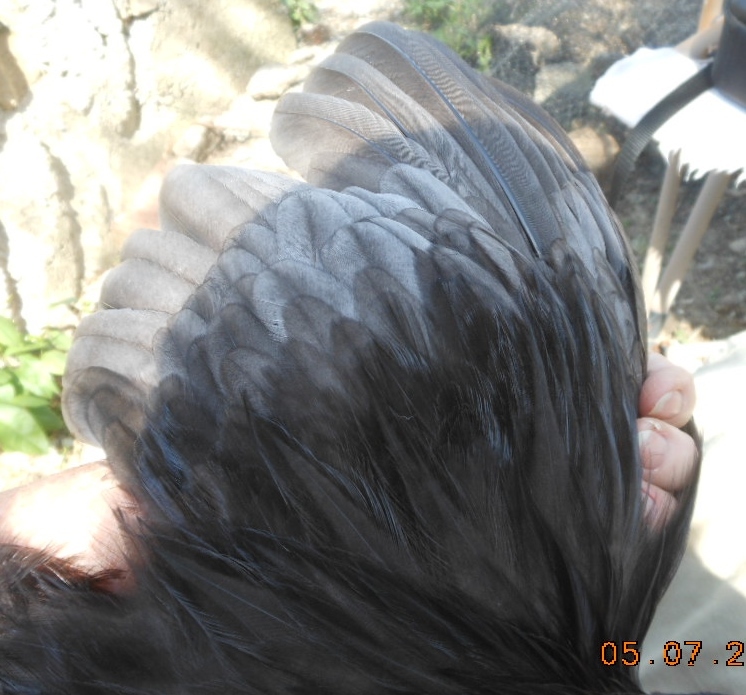 The blue coloring has large amount of brassiness in head, hackle and saddle; also mealiness in color in wings, and no distinct lacing on breast." "This guy has nice type and balance, very good carriage. I would like to see a little more width across the breast and back. 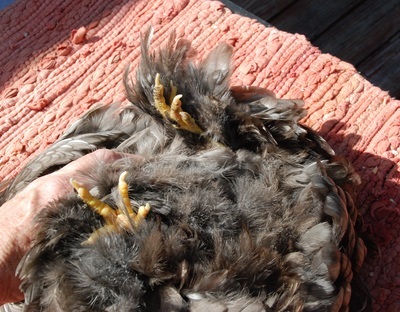 Comb, feet and eyes have nice color and shape. 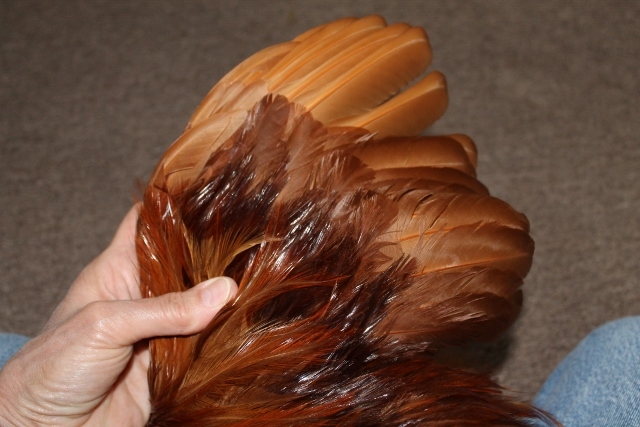 The feather color is very even, bright and distinct, very nice lacing over breast." 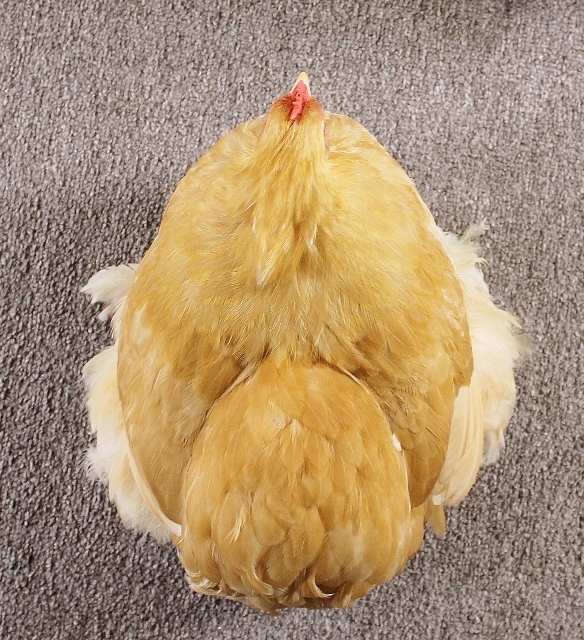 "This bird has nice shape, width and roundness. I could not tell about comb, very small, almost too small. The head is nice in size, wide, round at side view and short beak. 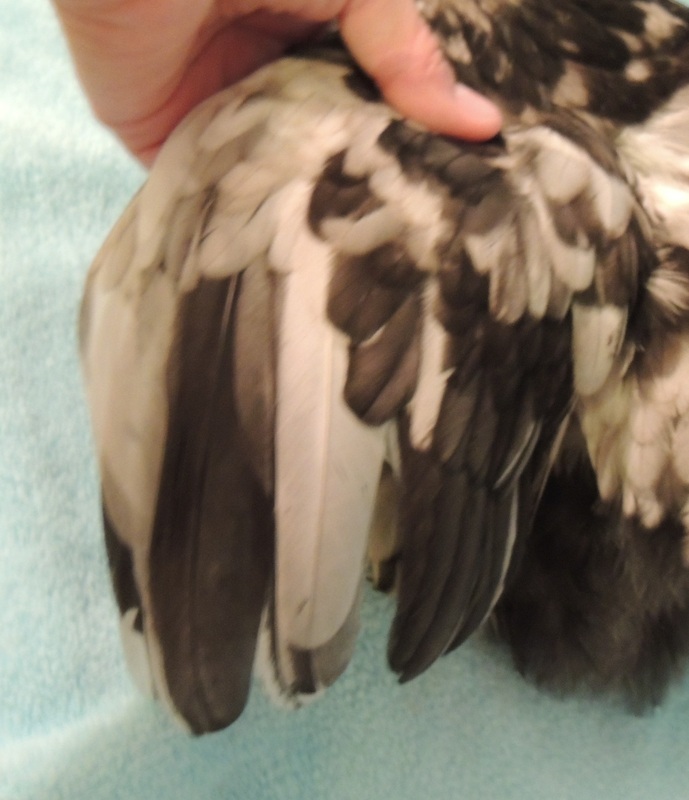 Her wings seam loose and open in center, feet nice yellow in color. The blue color seams light and pale, can also see some brassiness in hackle, lacing is present but pale." "This bird has nice width and roundness, a little dark in feather color but still has nice contrast between hackle and body, also distinct lacing. Head could be wider and more rounded in face, comb somewhat missed shaped, bulging in front and beak looks long. 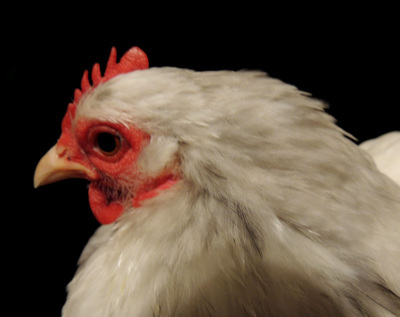 Eye color seams off and white or paleness in earlobes. Her top view shows a very nice typed Cochin. 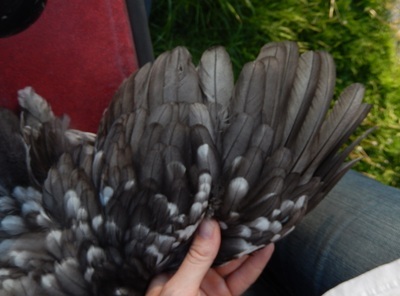 Wings are strong and carried up very nicely. 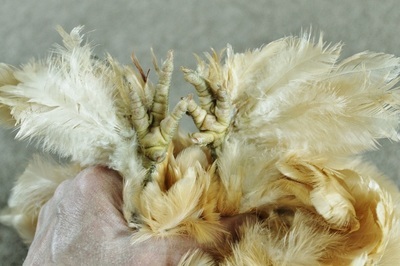 Feet very pale all most white looking." 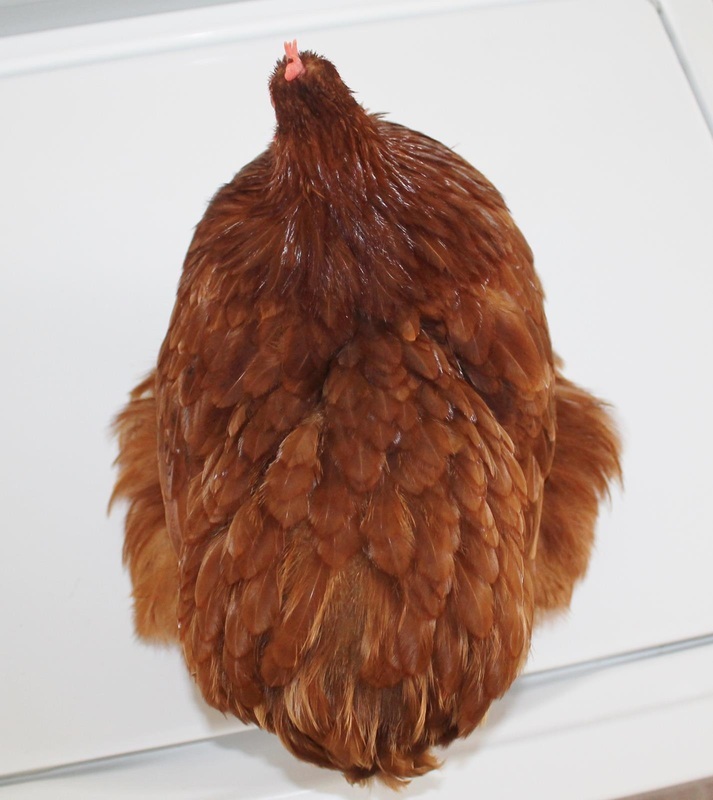 "This bird shows good type, carriage, width and roundness. Her color bright, good contrast of head, hackle, body and lacing. 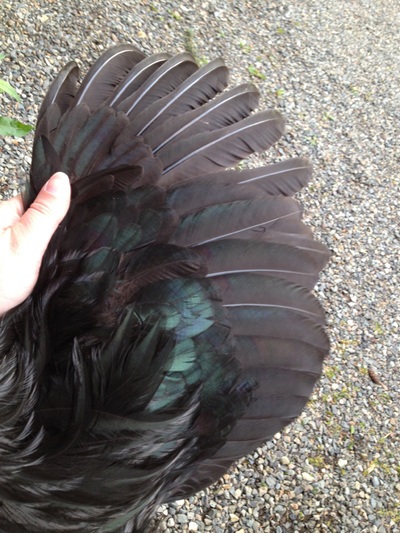 Only negative on color a few dark feathers spread out across the body. 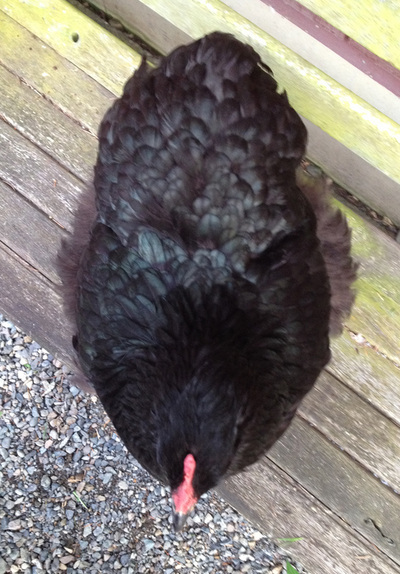 Her head, comb, eyes, beak shows nice size, shape and color. 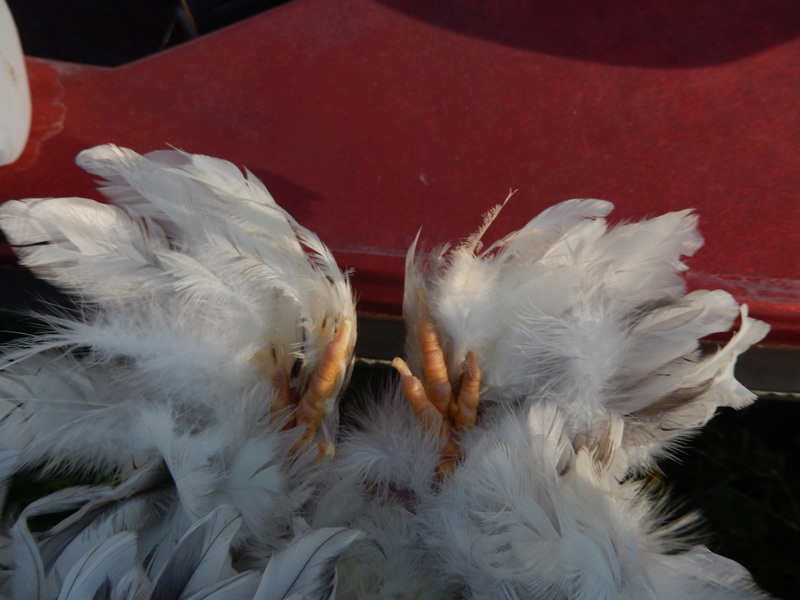 Feet color light near white." 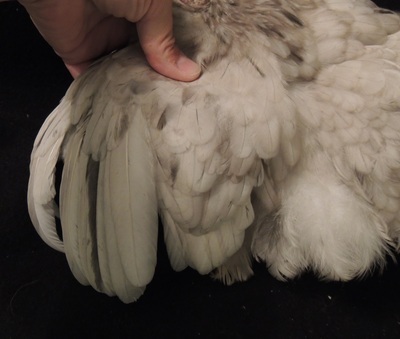 "Good type, good condition, color shows appears to be uneven, comb off shaped, incorrect number of spikes, eye color and leg color correct, wings strong and up tightly." 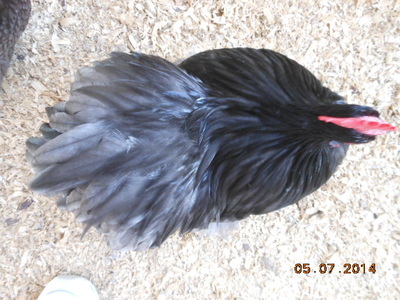 "Type is good, would like to see more fullness in chest, nice even color and in good condition. 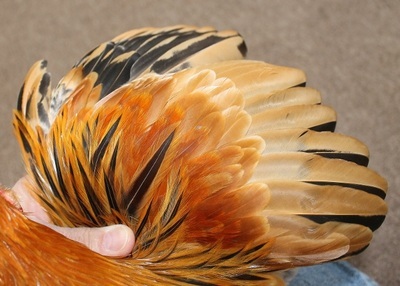 Comb has 5 nice spikes; blade may be a little long but nice and straight. 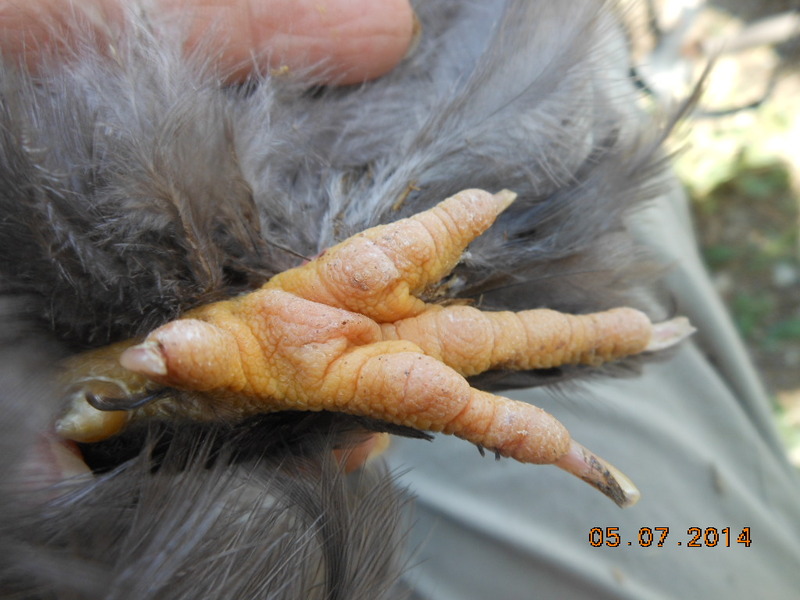 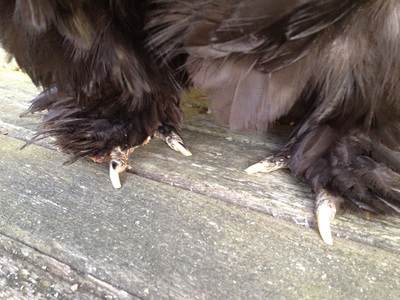 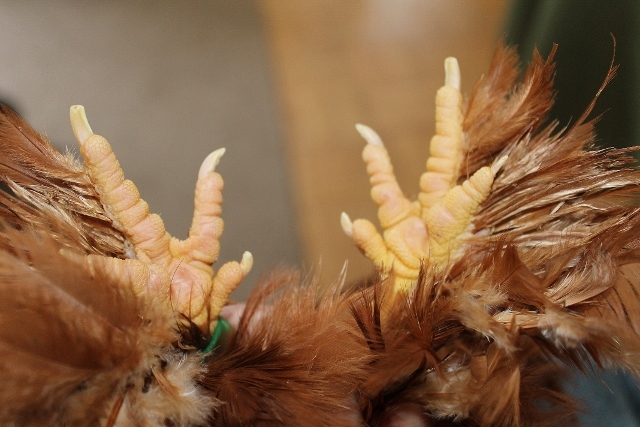 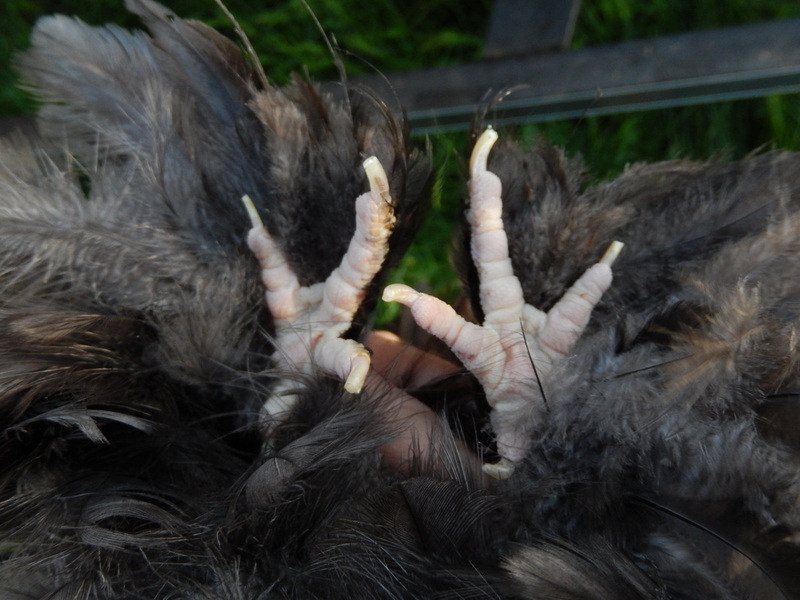 Eye color and feet color correct, wings could be stronger when spread but carried nicely." 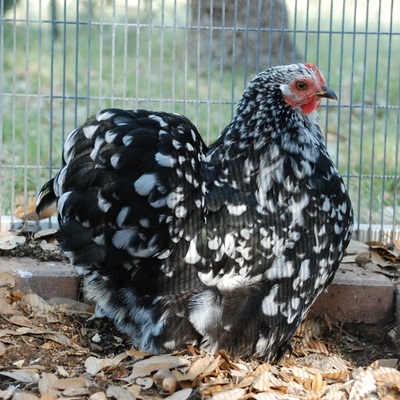 "Top color is nice and good columbium markings. Good size comb, 5 good spikes, blade a little long and twisted just a bit. Eye color and feet color correct, some white tipping in feet feathers, wings nice and strong carried well, good color markings. Chest carried a little high, overall nice bird." 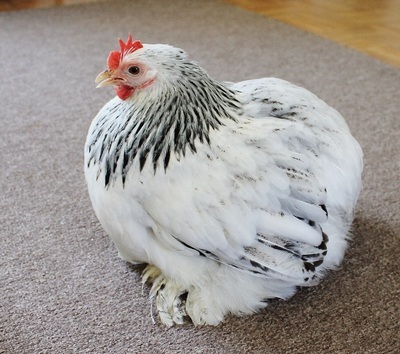 "A very nice round bird show good type, good top color and nice wing and carriage. 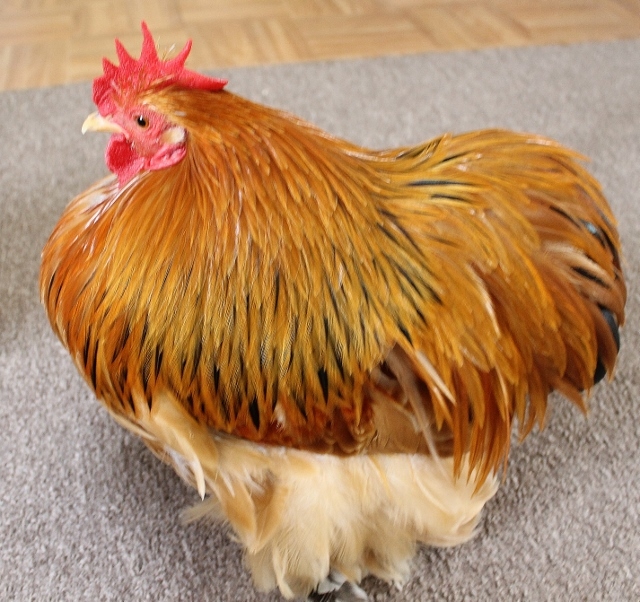 Comb has several issues, shape, and number of spikes. Eye color a little dark as well as feet color being dark and maybe has a green cast (this is a DQ but just may be dark due to picture). Wing color in primaries off needs more black and a definite buff edging. 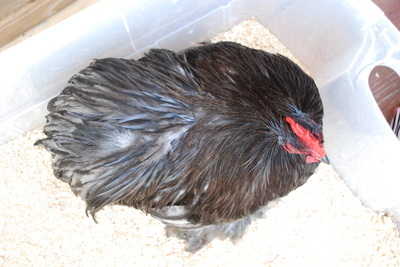 Conditioning and type give her the edge over the male." 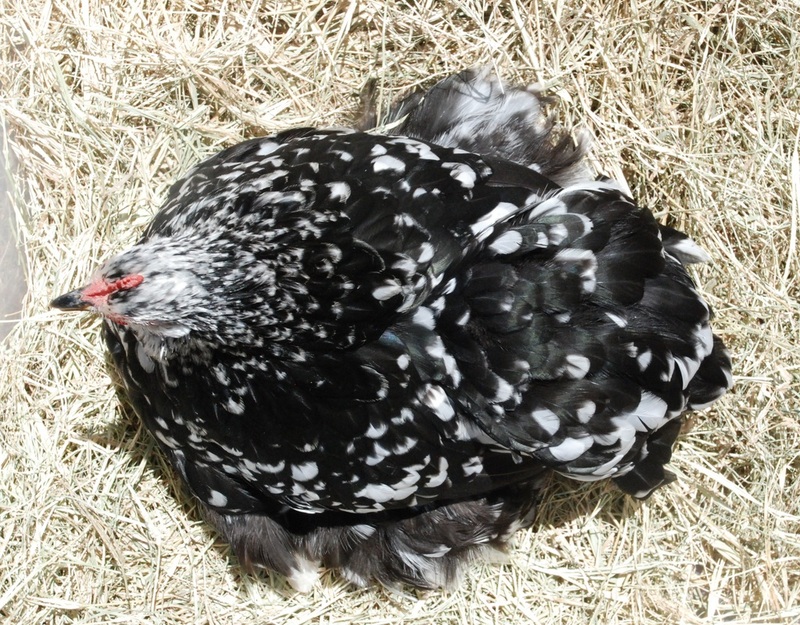 "Type here is not good, to high in chest, lacks fullness and roundness in body, tail to small and pointed. 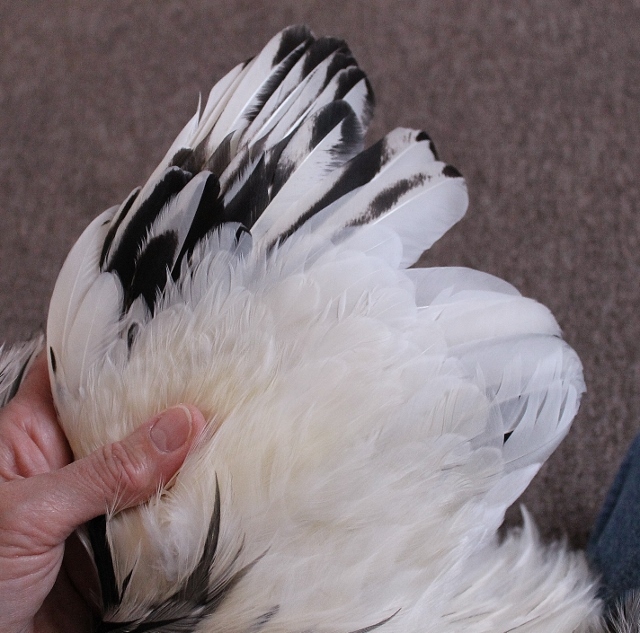 Comb nicely shaped, missing one spike and slight curve to underside of blade. 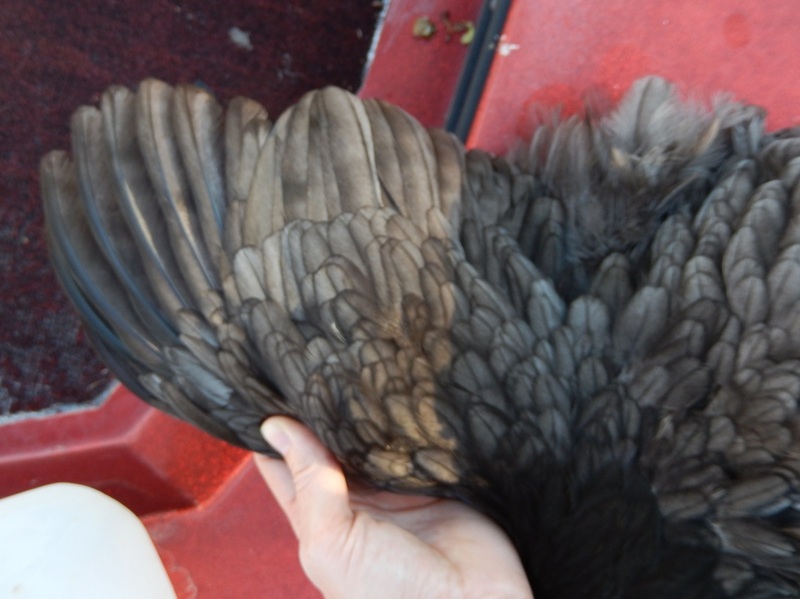 Wings look weak when spread and color off in primaries. Feet color is good." "Nice round bird carrying good type. Top color has to much bleeding through od under color, hackle color is broken up and looks spotty. 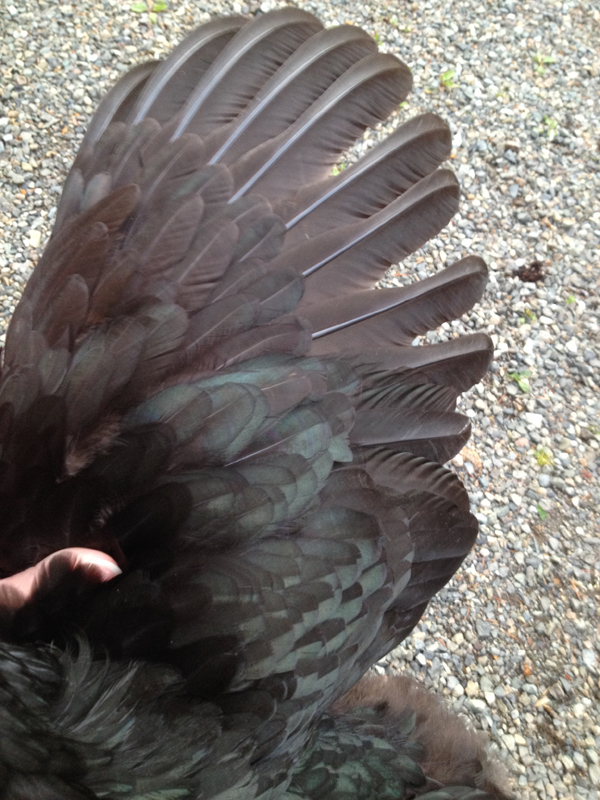 Wing look weak when spread, color needs to be more even and primaries need better markings of black. 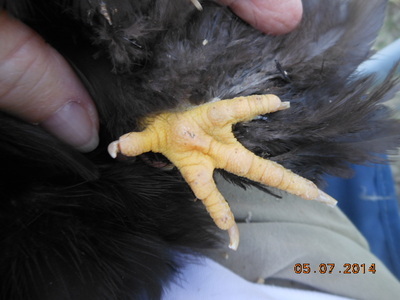 Eye color a bit dark and leg color good yellow. 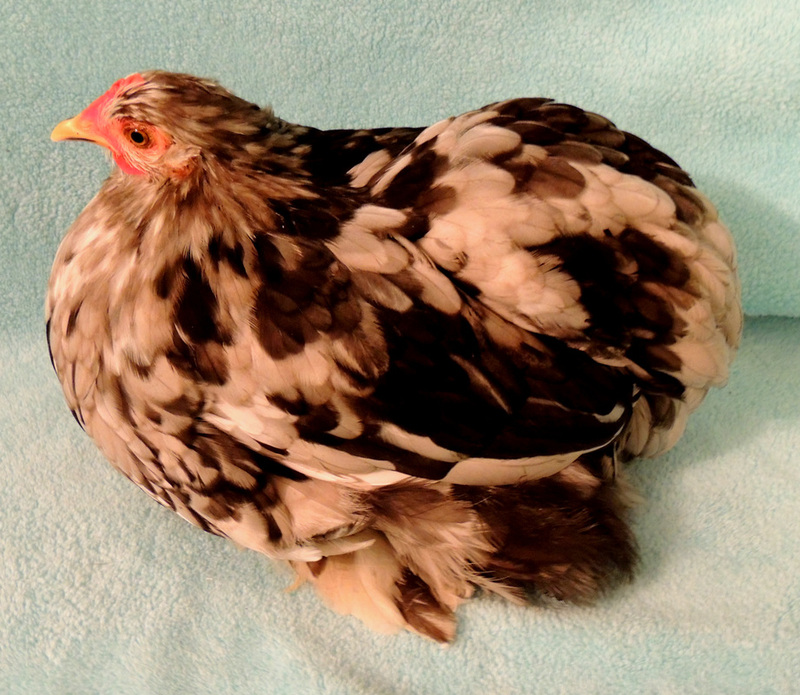 Good condition and type give her the edge over the cockerel." 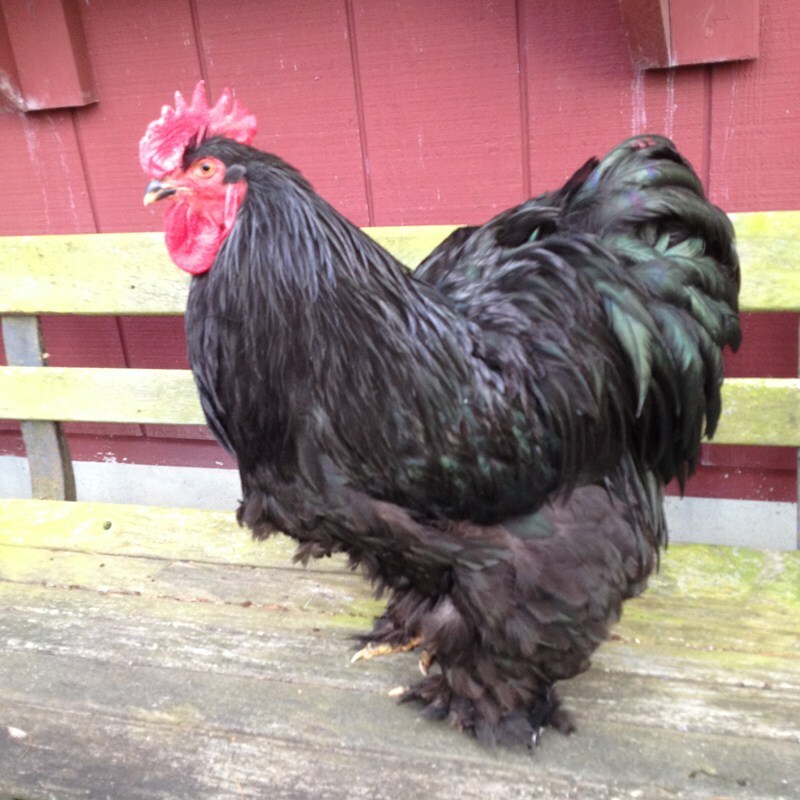 "Very nice condition and type, would like to see more width. The head, eyes, beak, comb and feet are all correct and very nice. 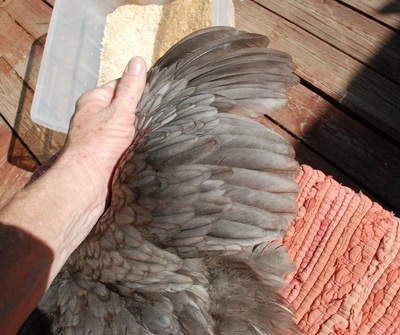 Wings also nice and tight carried very well. 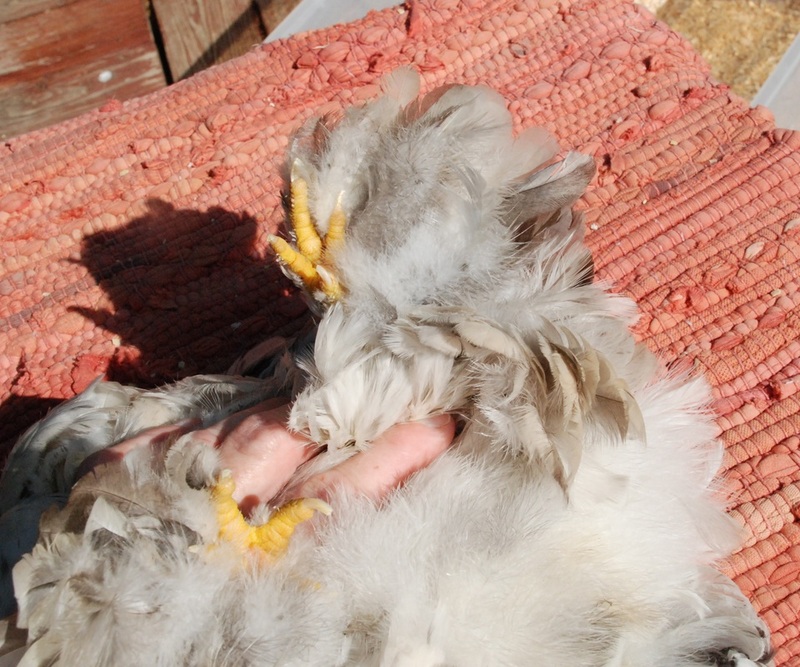 The flaws I see are in color; white tips tent to be bid round spots and heavy in areas, I do see some nice V tips in the feathering." 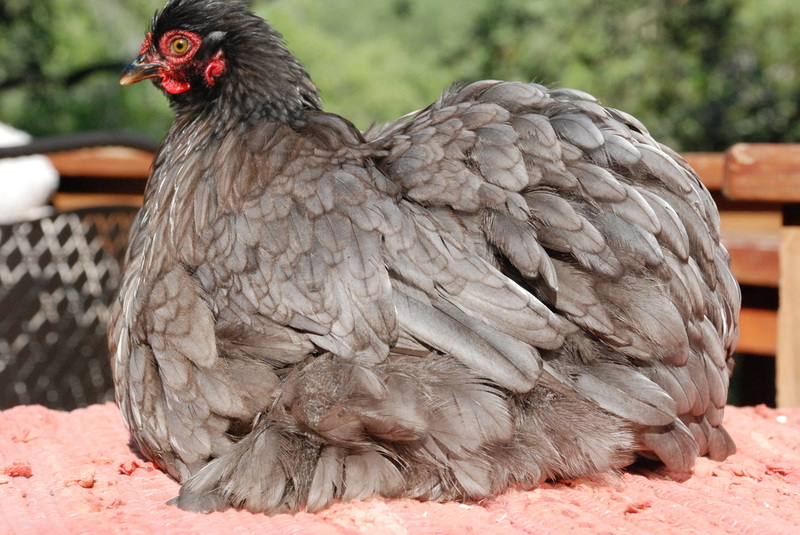 "This bird is long and narrow, flat on top, has high carriage in front, showing poor type. His color is showing some unevenness due to poor condition. Comb has good shape but missing spike, wings are good, feet color good. 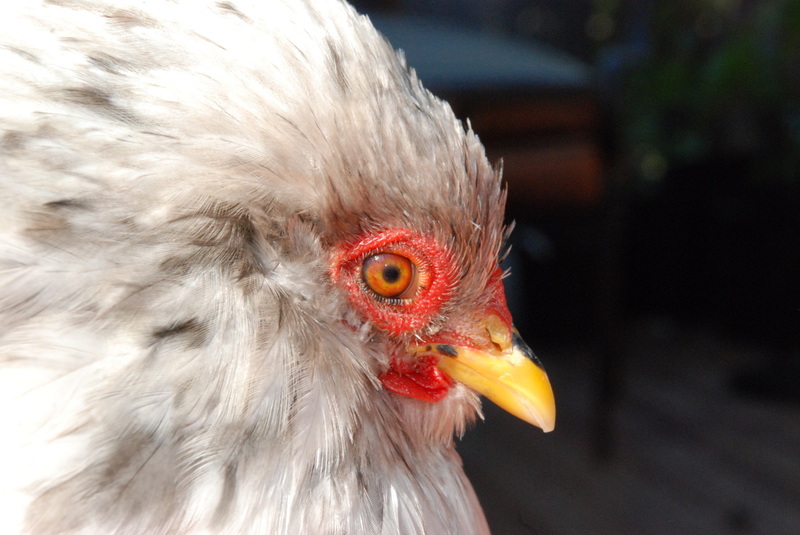 Eye is light and broken in color." "Nice type, would like to the cushion carried a little higher, condition and color is a little off. 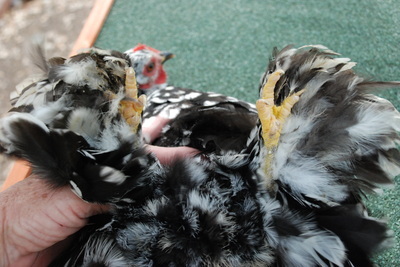 I would like to see better separation of spikes on comb. Wing good but showing some mealiness of black in color. Eyes and feet very good." 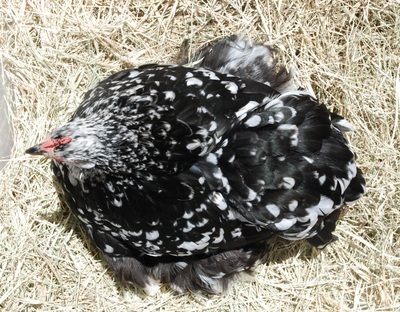 "This is a very nice typed bird, wide, round, good carriage, strong wings; head, comb eyes very strong. 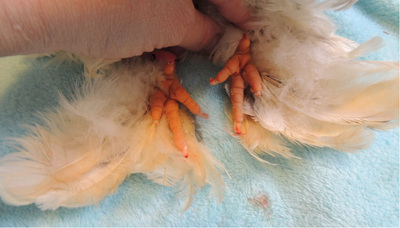 Feet light in color. 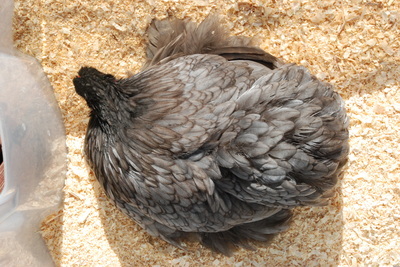 The blue coloring is very nice and even showing good contrast to hackle and body, some areas has too much white grouped together. 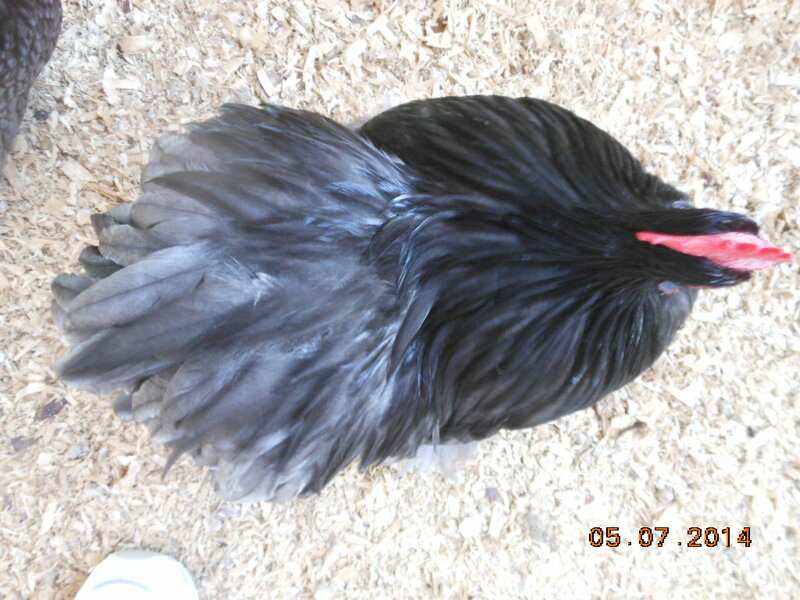 This is a very nice Cochin." 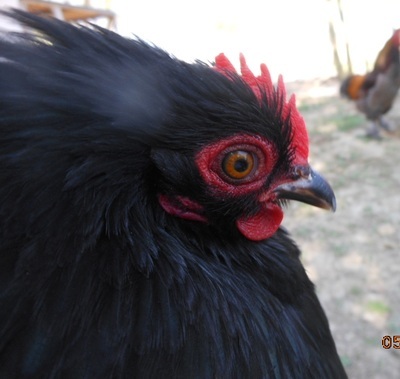 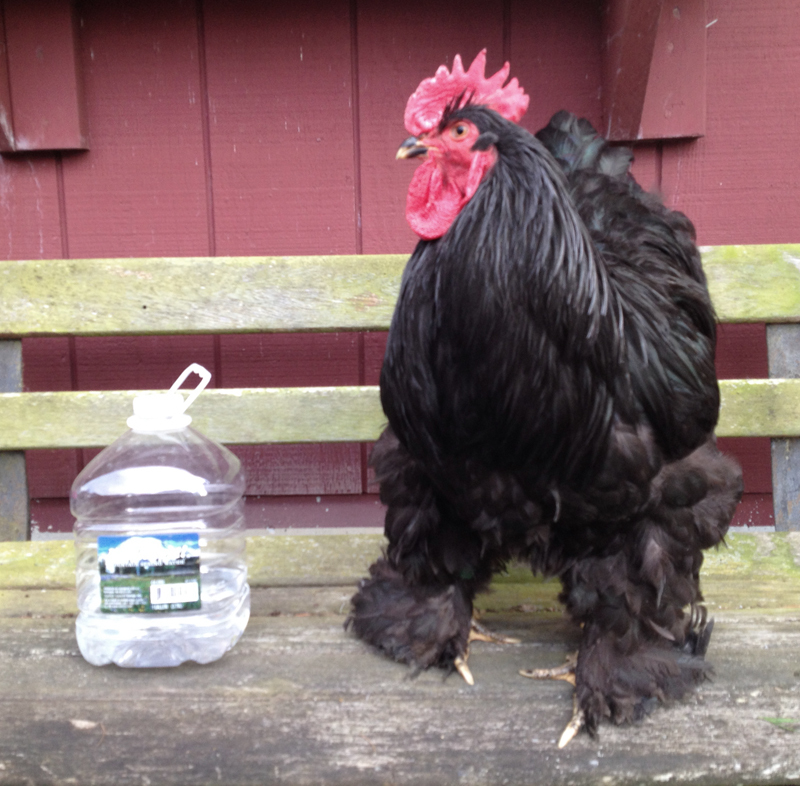 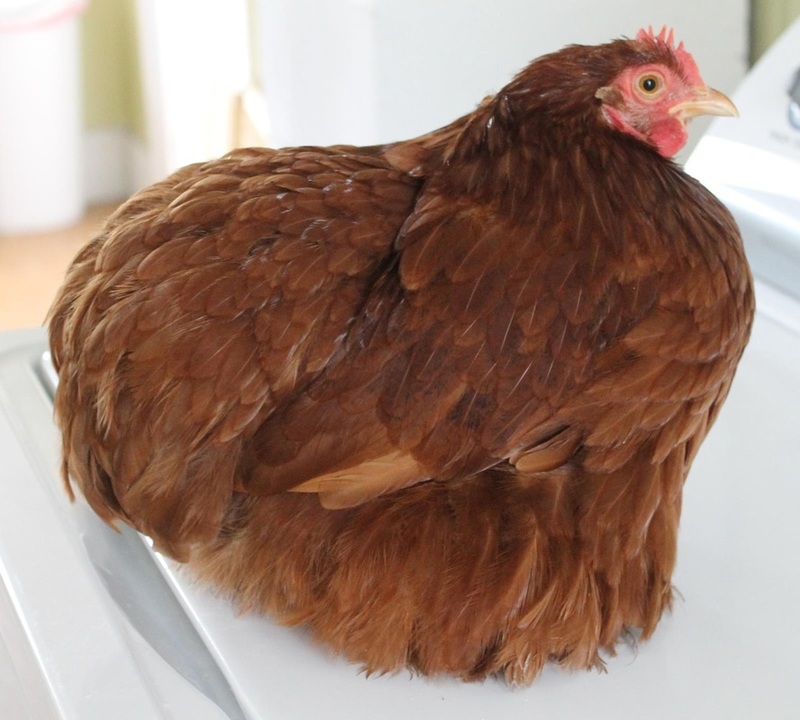 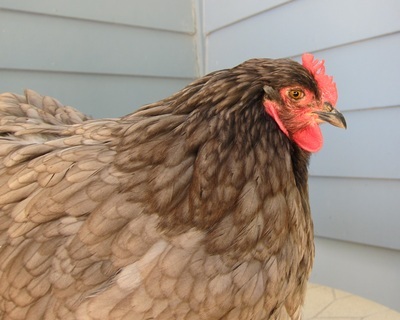 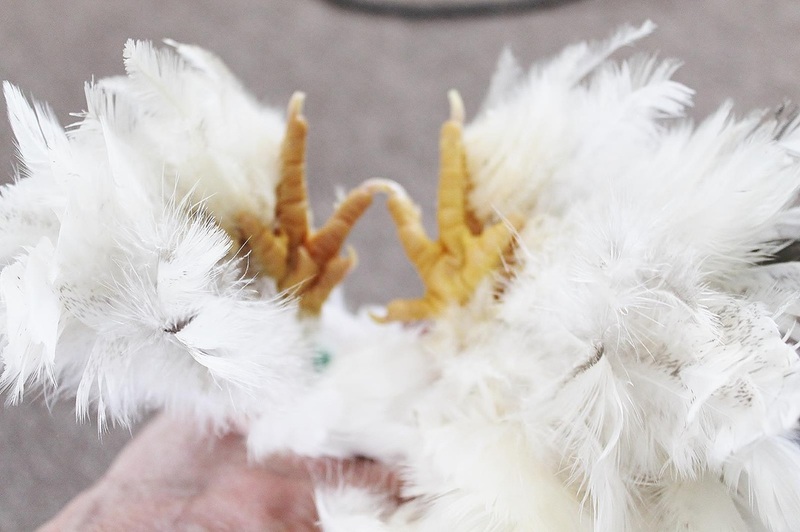 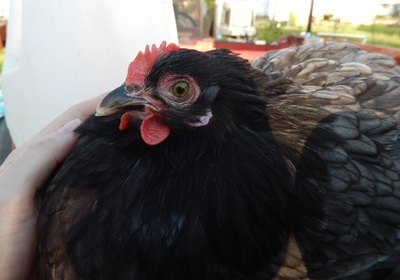 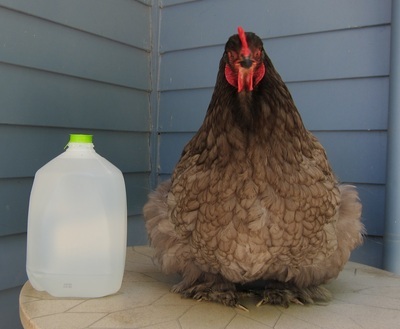 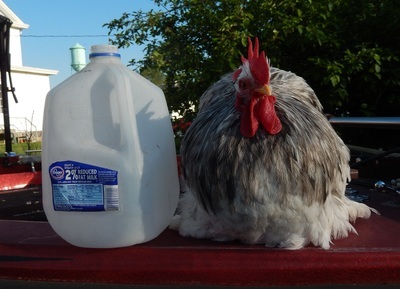 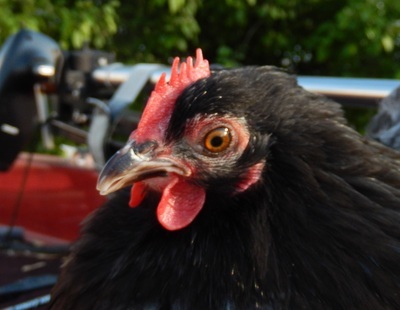 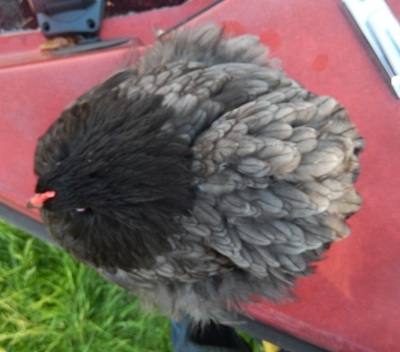 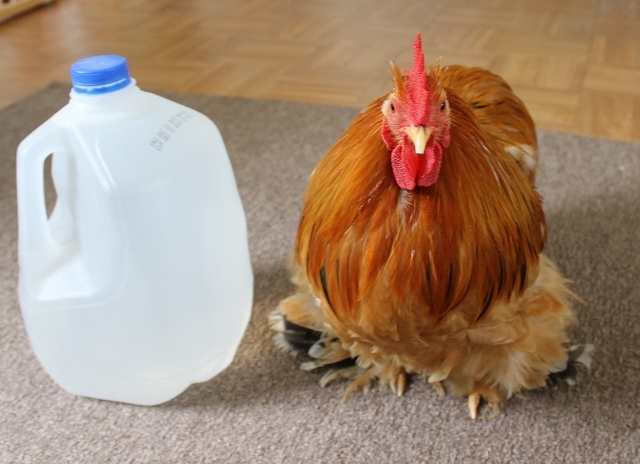 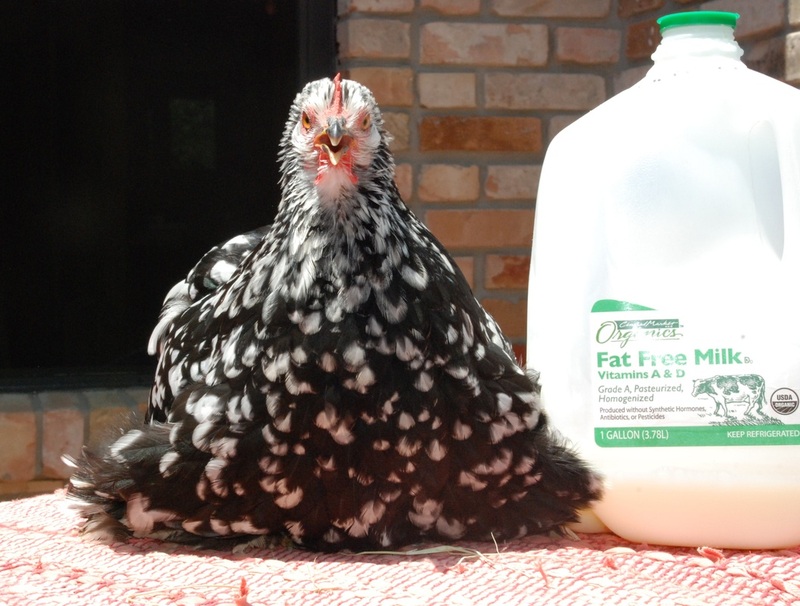 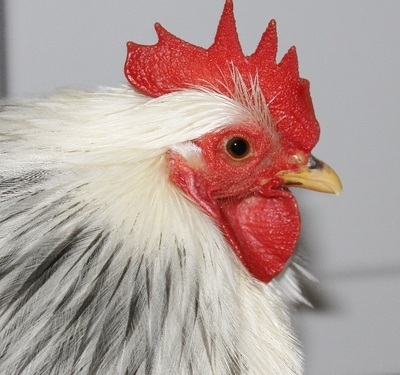 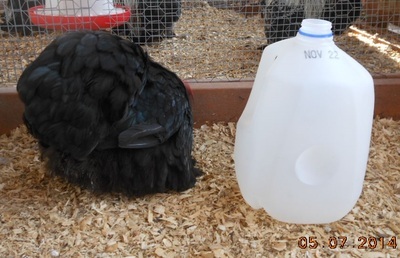 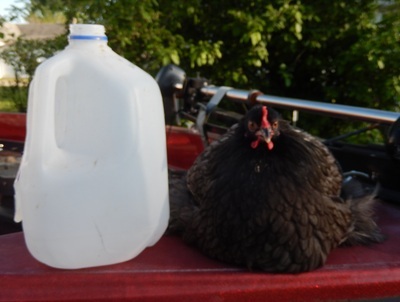 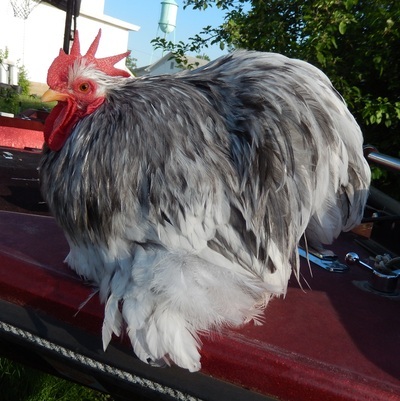 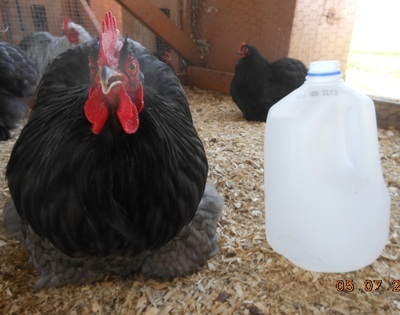 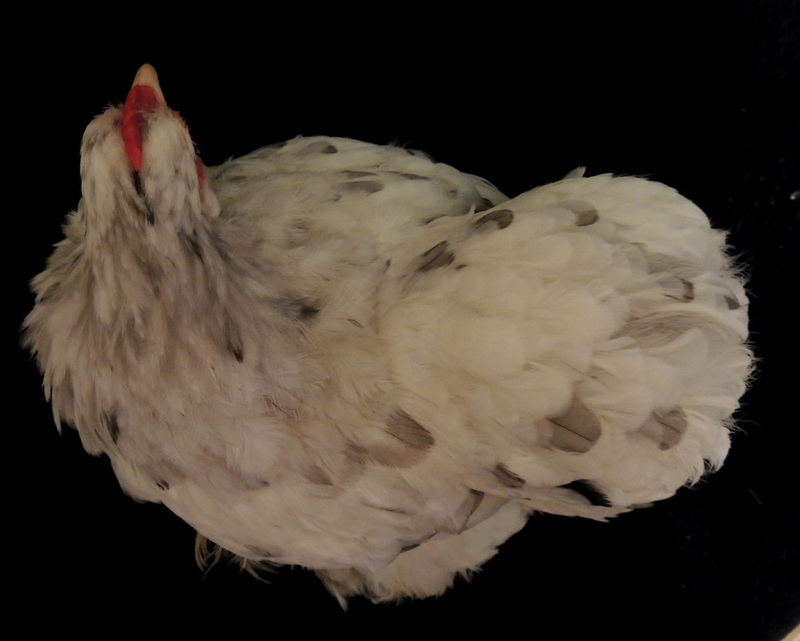 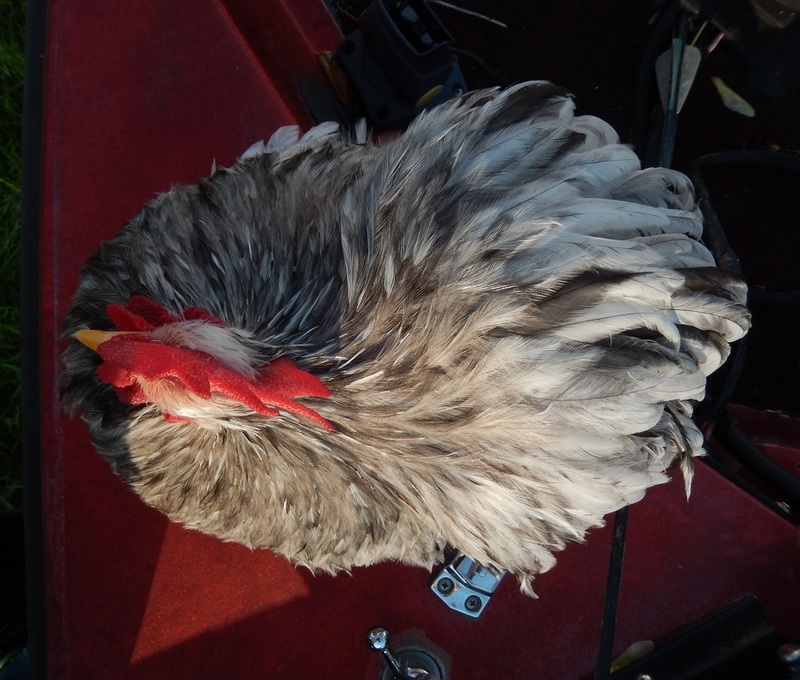 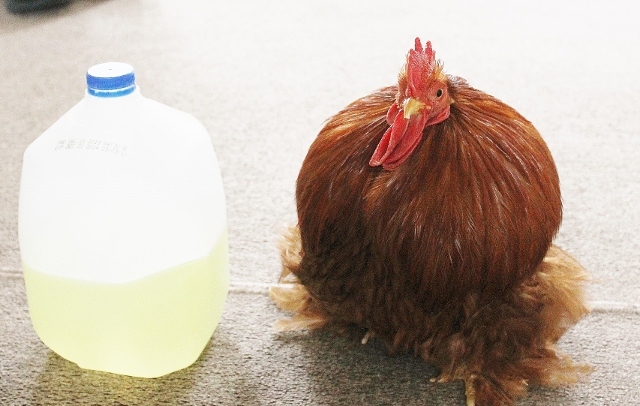 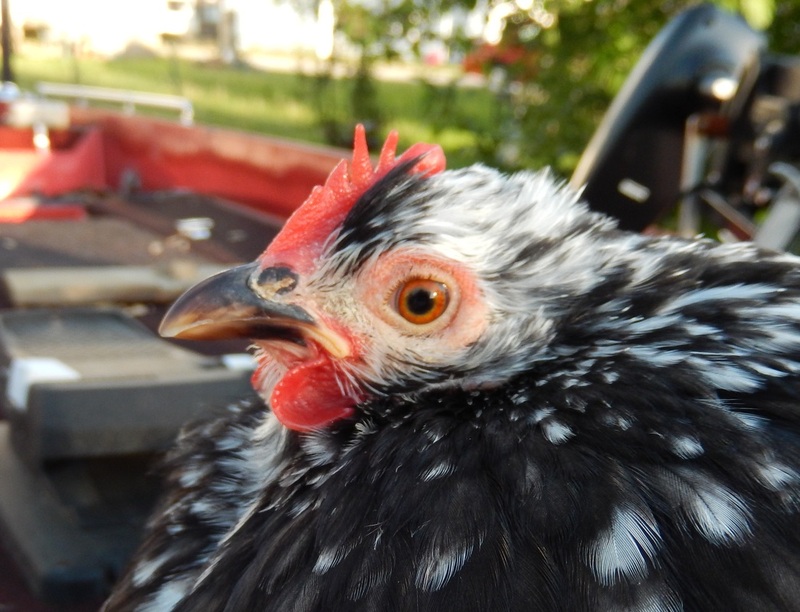 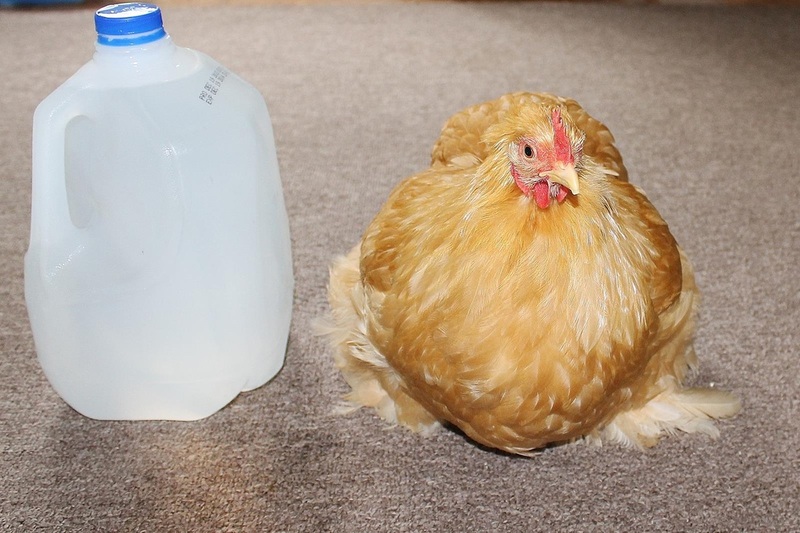 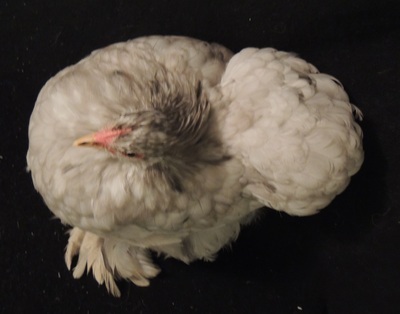 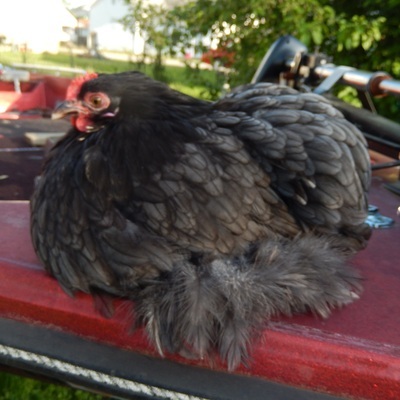 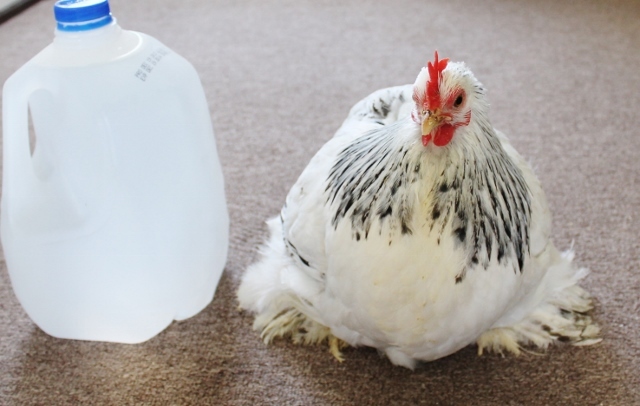 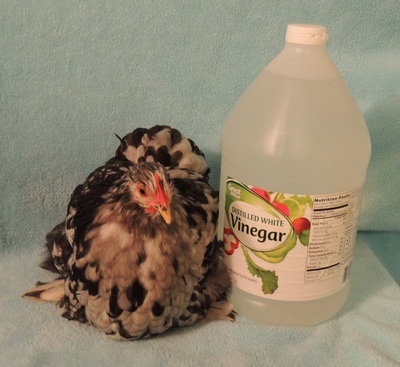 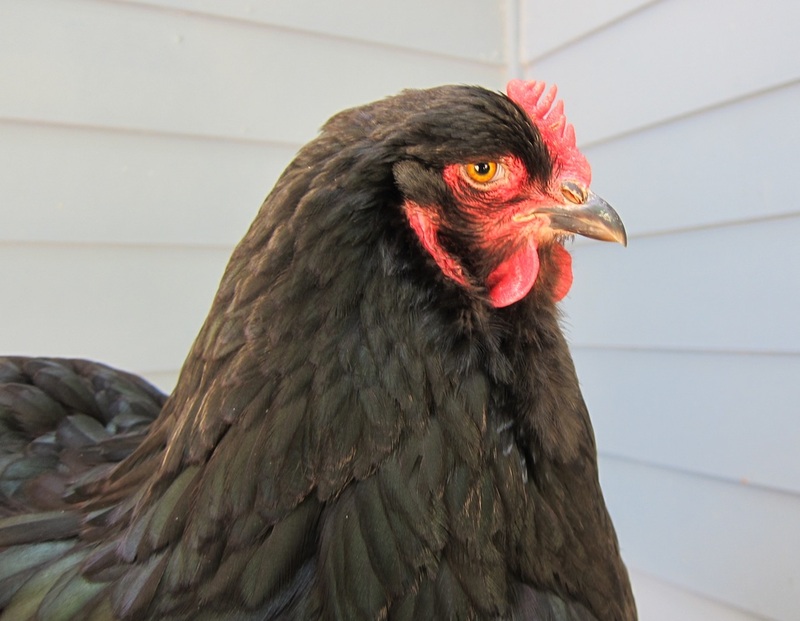 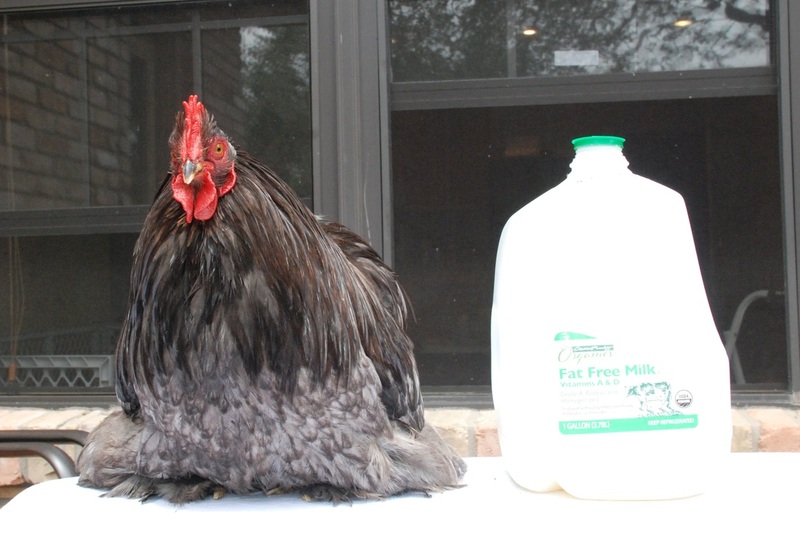 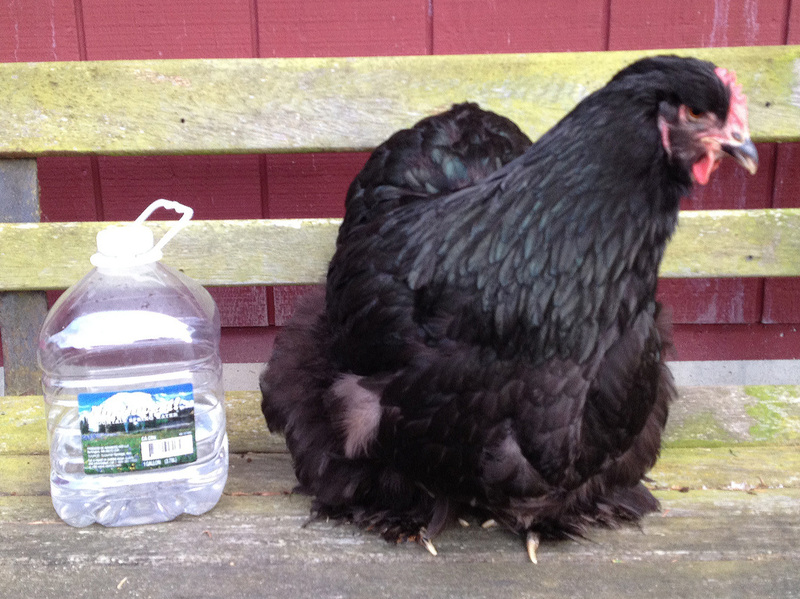 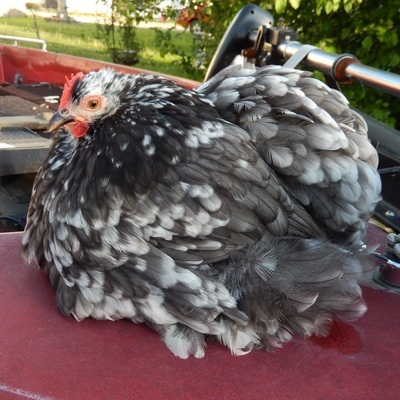 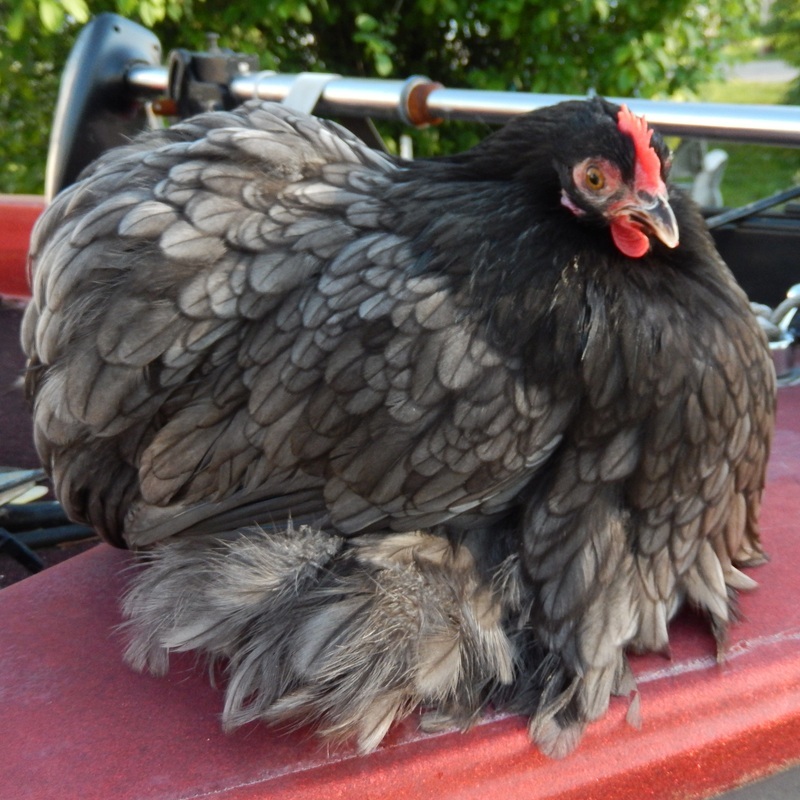 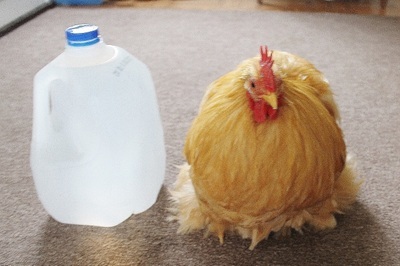 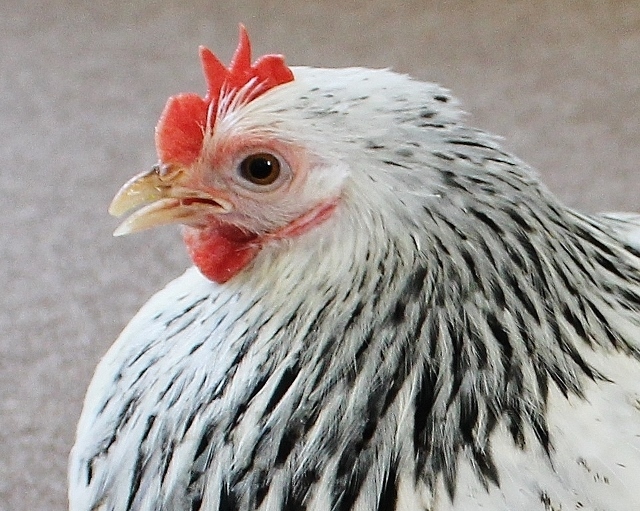 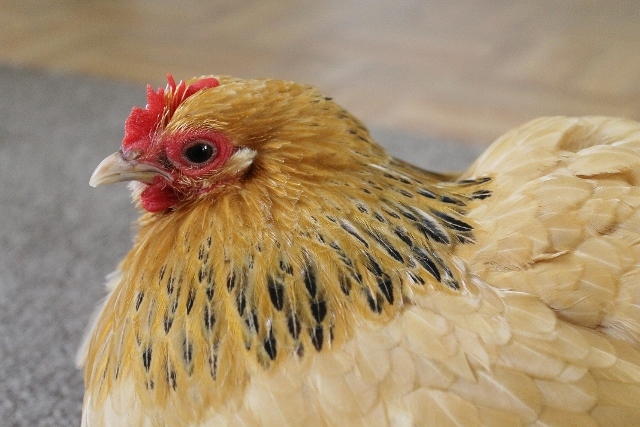 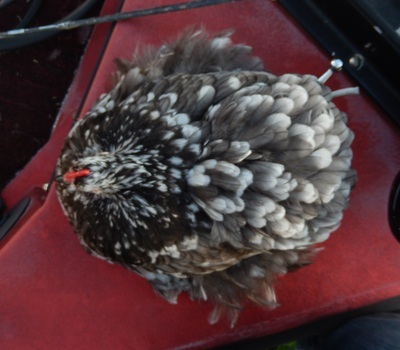 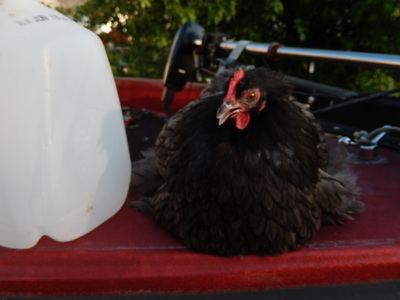 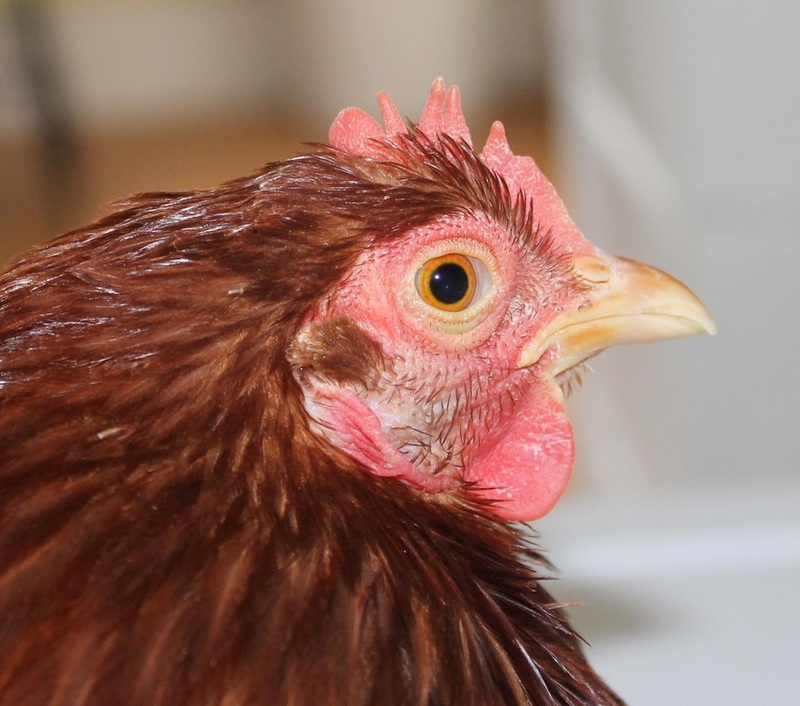 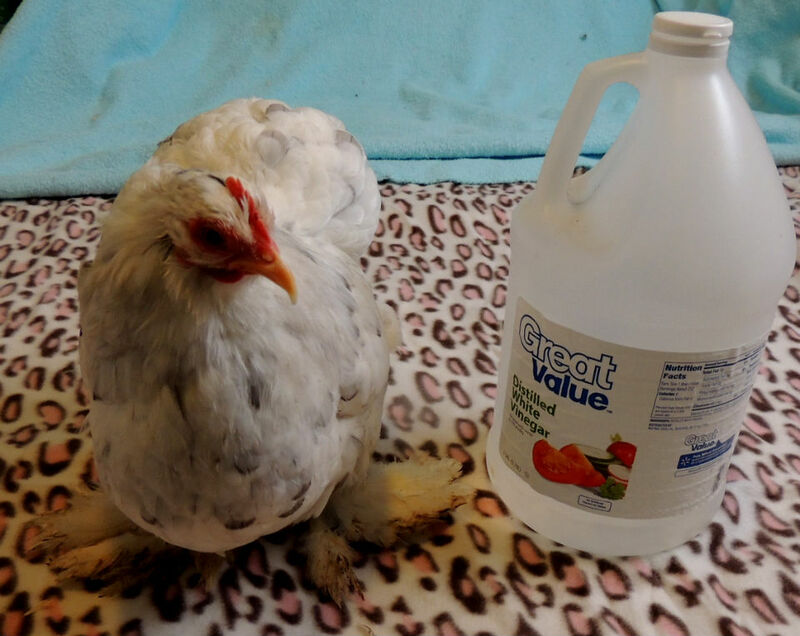 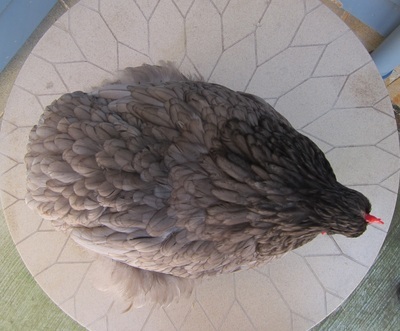 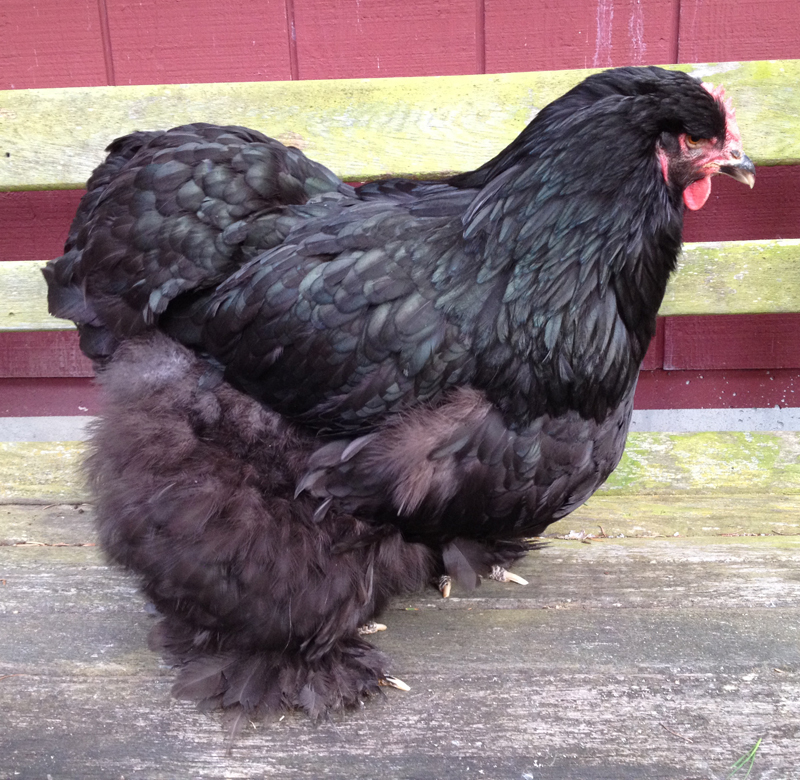 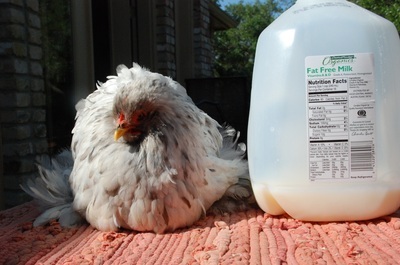 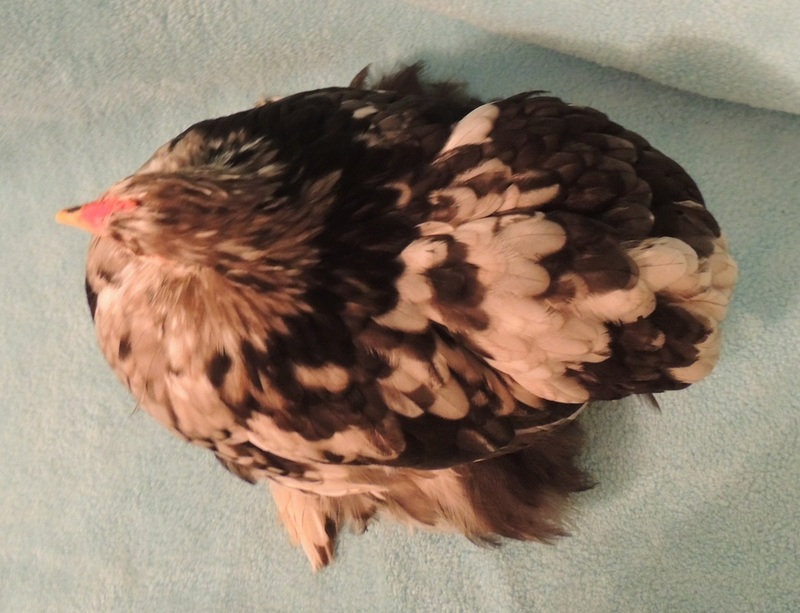 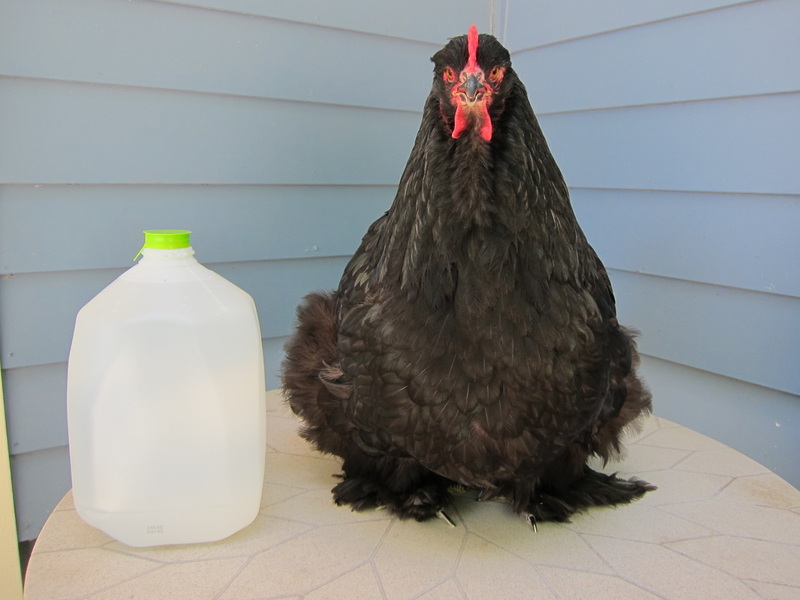 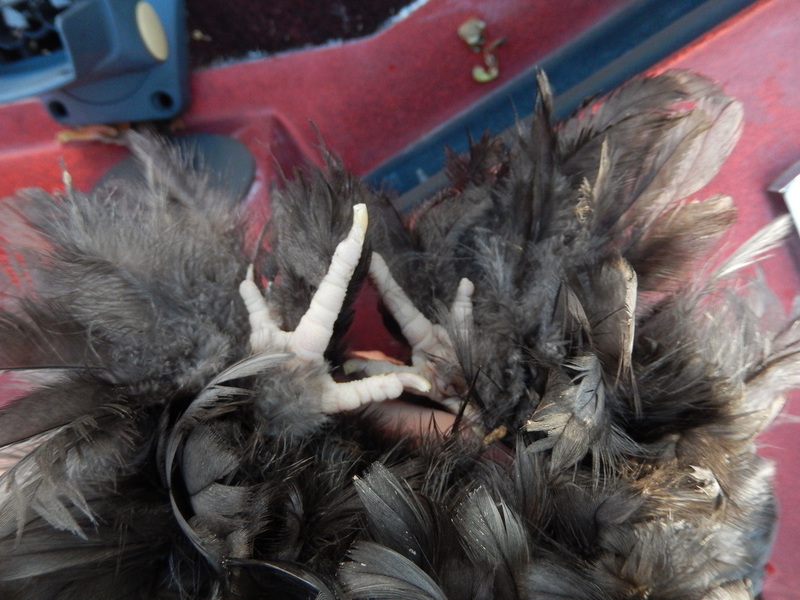 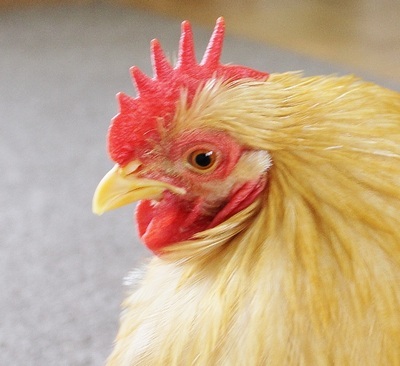 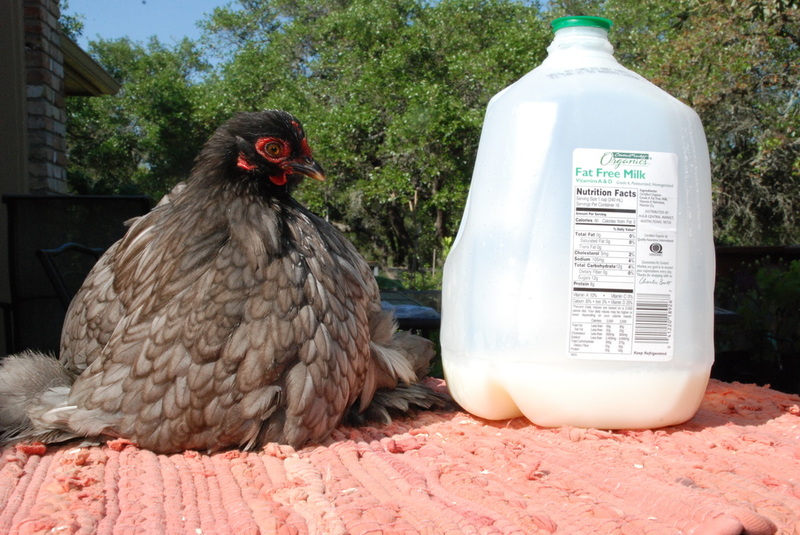 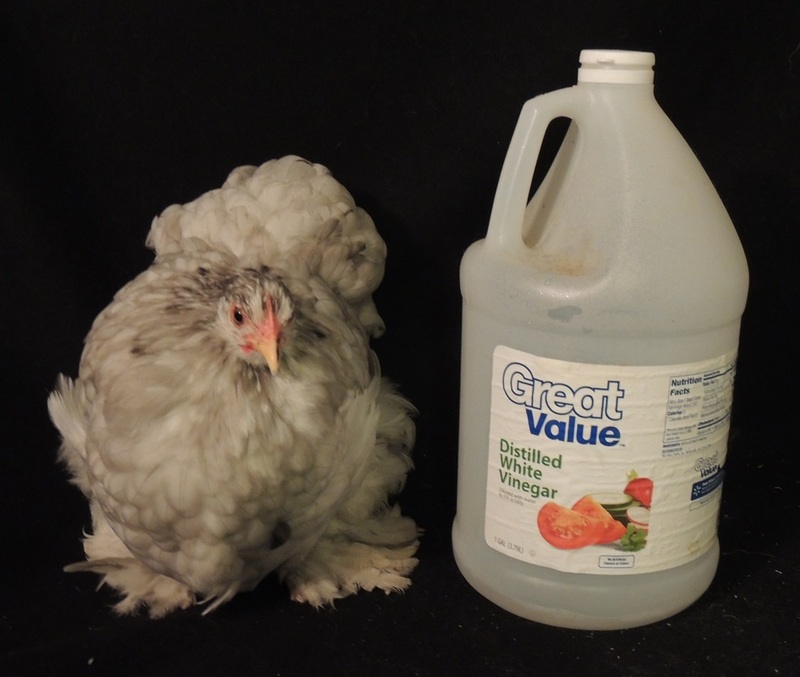 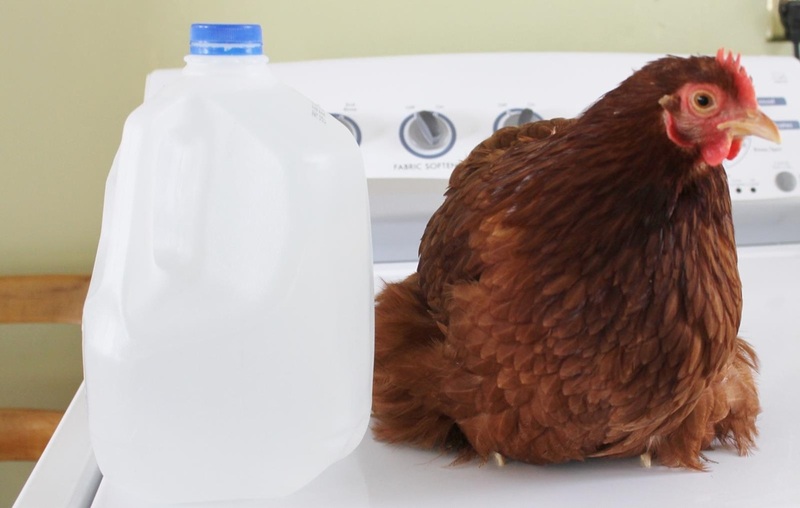 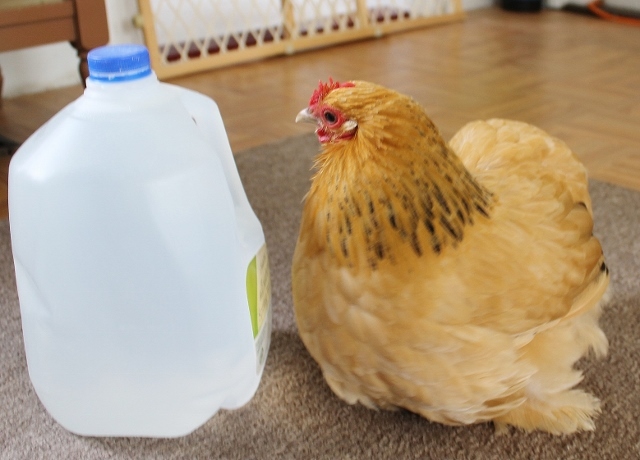 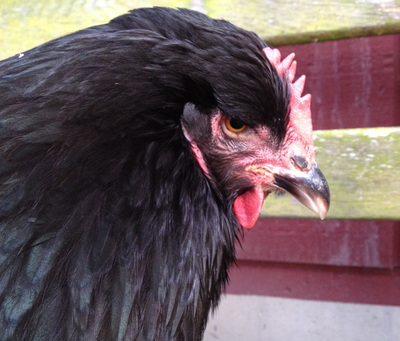 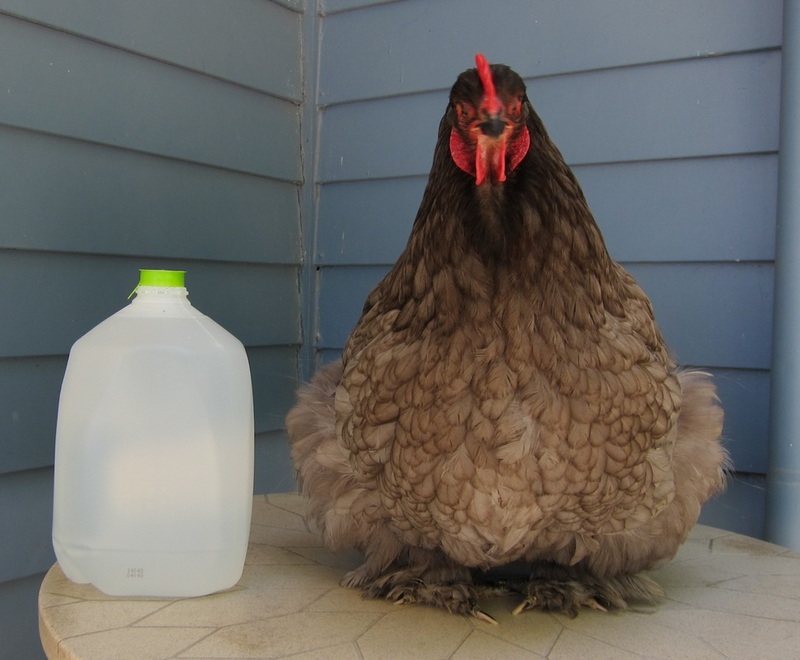 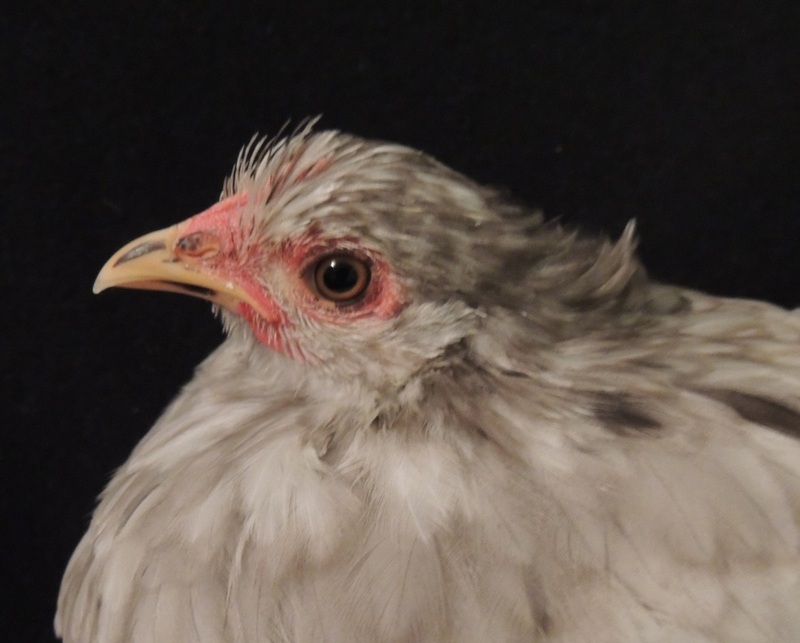 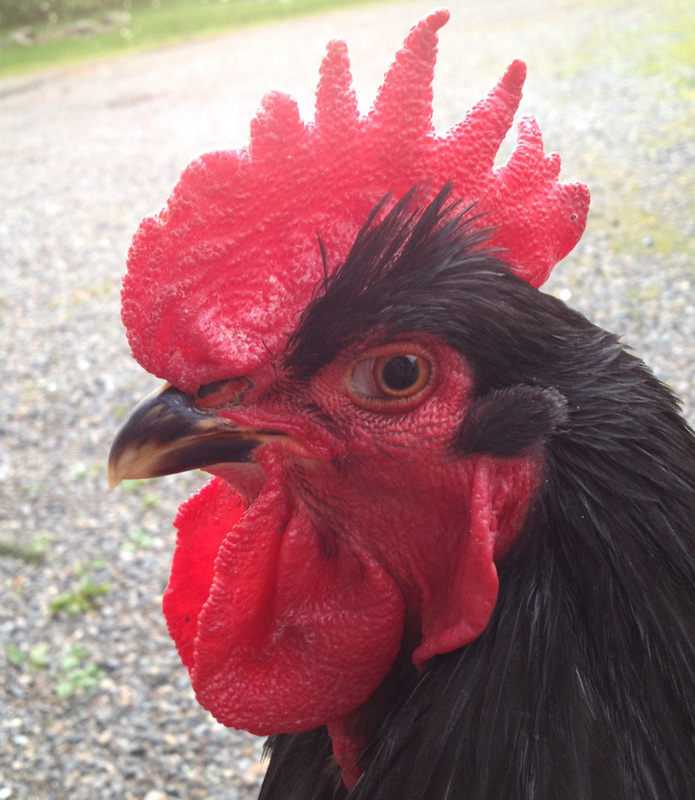 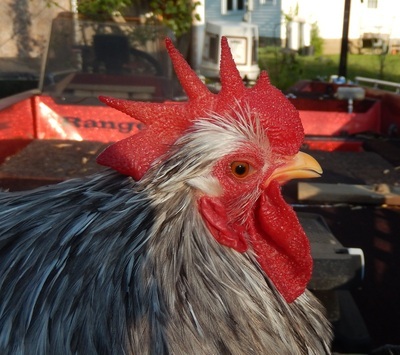 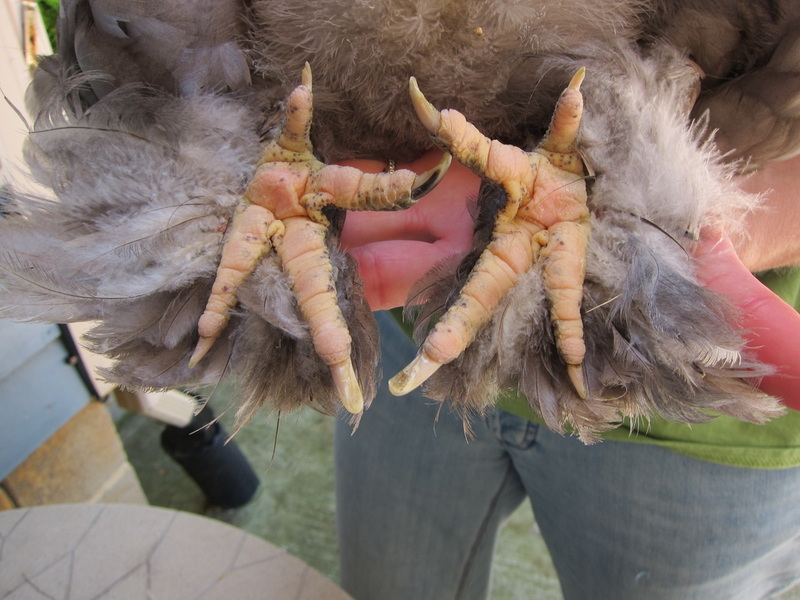 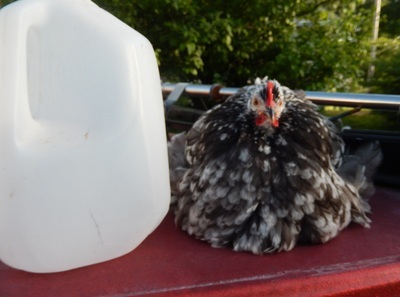 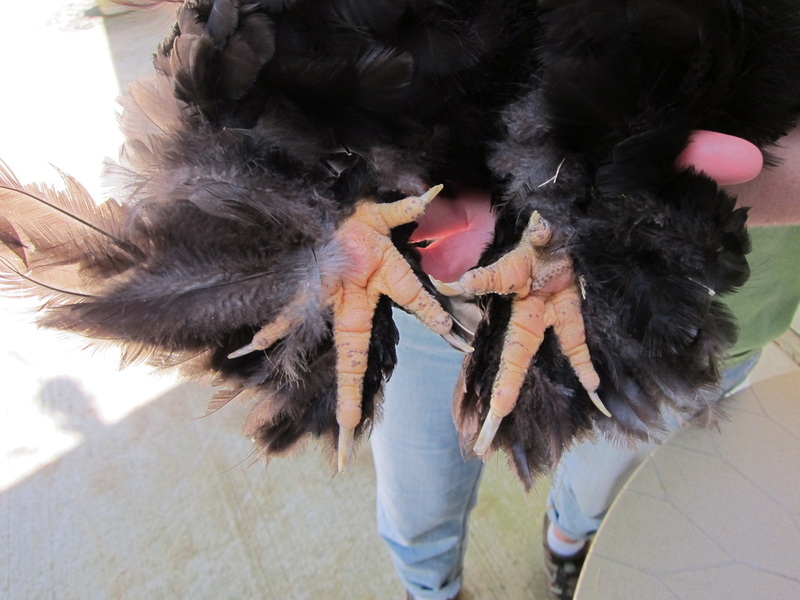 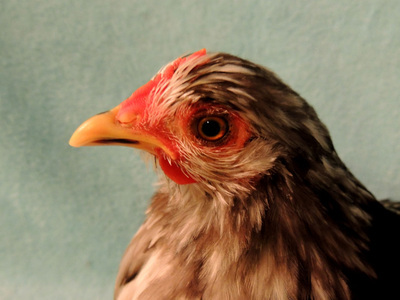 "This pullet is very young, need lots of filling out. The narrowness shows throughout, head, body; wing not finished making them appear weak; eye color is wrong color; feet color nice and yellow." 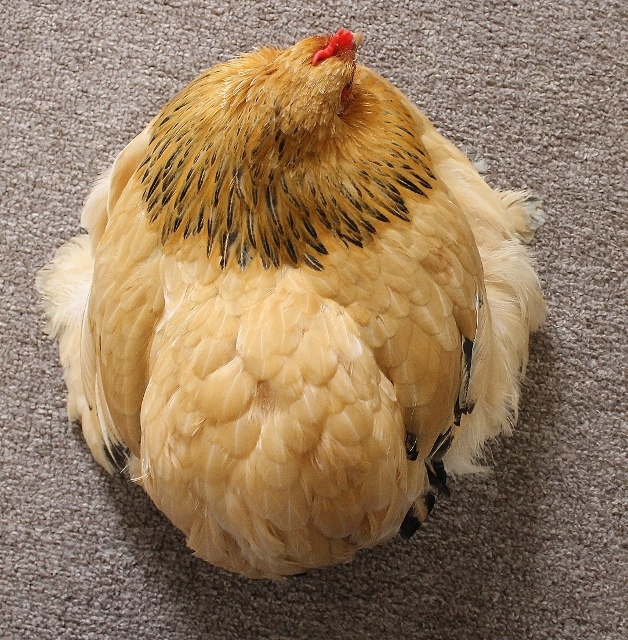 "This pullet is hard to judge, I think the angle of the pictures is the problem, she looks squashed, not shape, very hard to determine type. I would like to see some height in the cushion a little more back, some separation of hackle and cushion. Head, eyes, comb, wings appears to be correct. 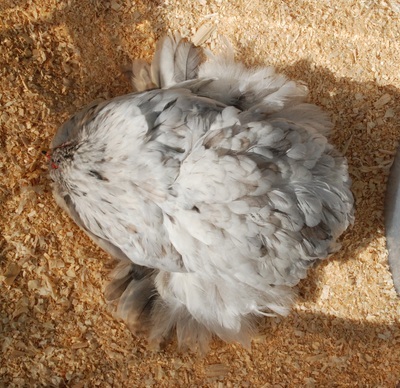 I do like the fluff in the shank areas." "Very nice type, color is very good, nice and even coloring with the splashing of blue. Comb very nice, eyes, feet correct. Wings are strong and carried up and tight. 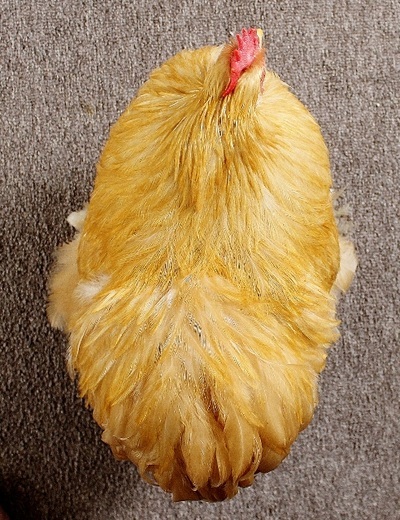 The head could have a bit more width. 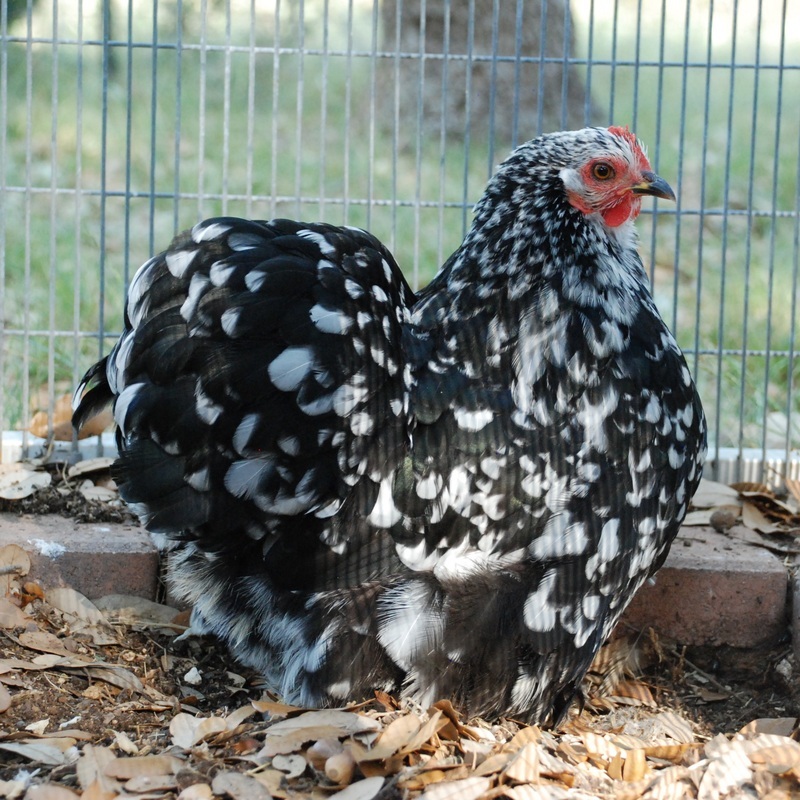 Overall this is a very nice Cochin." 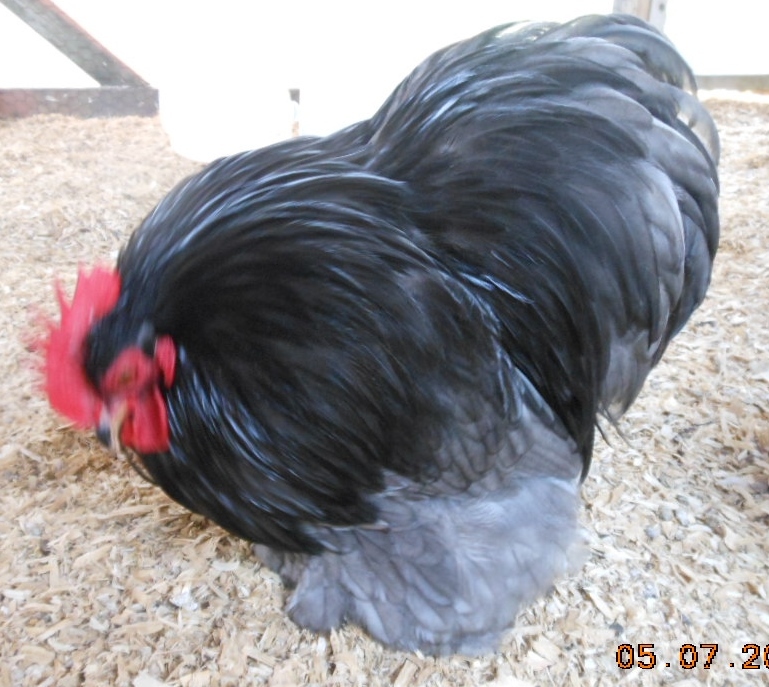 "This is a very nice male, good type, width and well rounded. 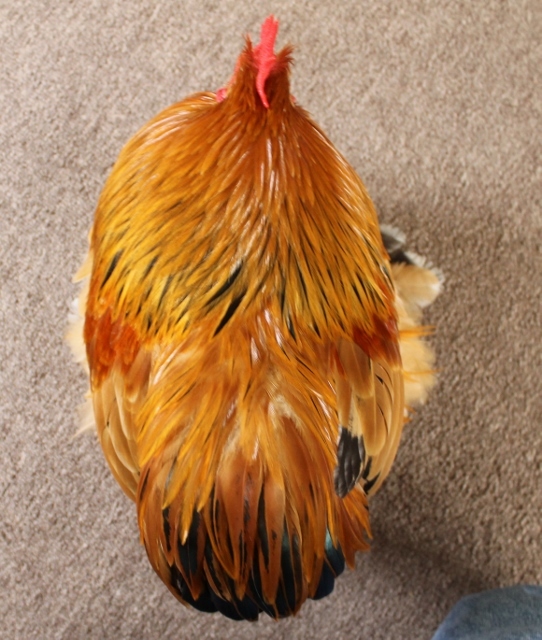 I would like to see a little back and separation of hackle and cushion. 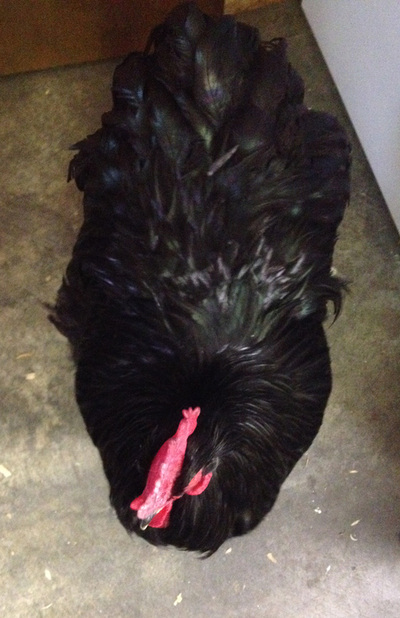 His beak, eyes, wings, feet are all correct; comb is missing 1 spike and a bit large. 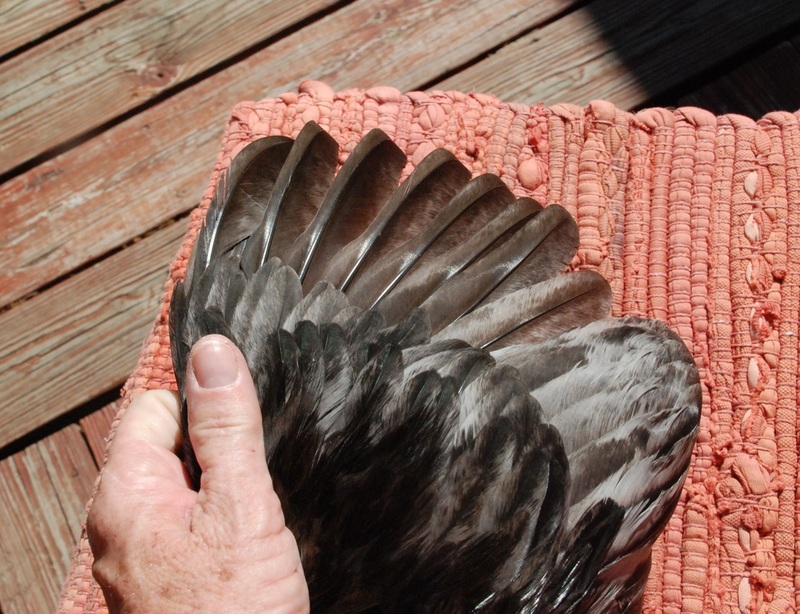 Overall this is a nice bird." 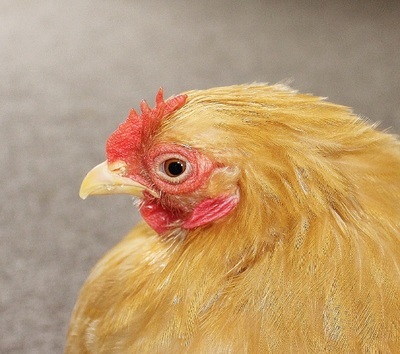 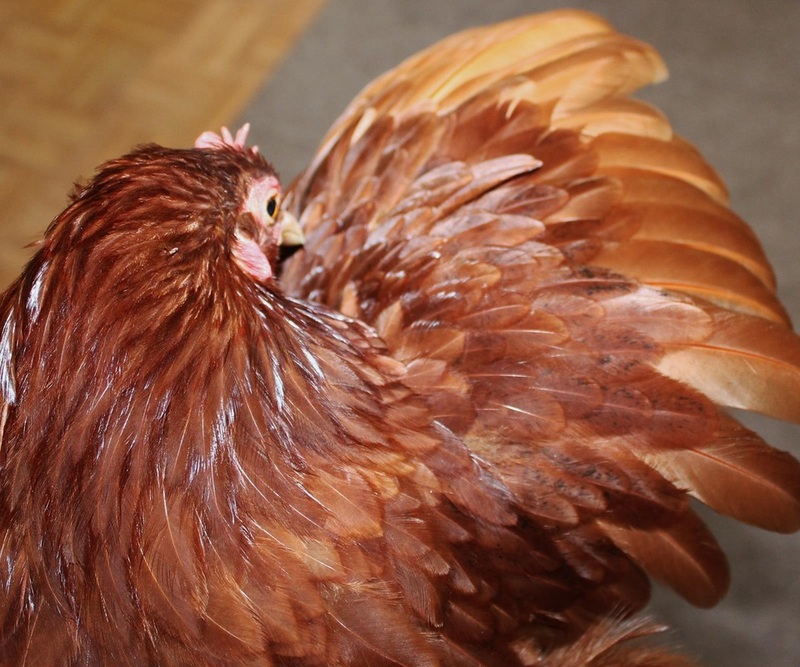 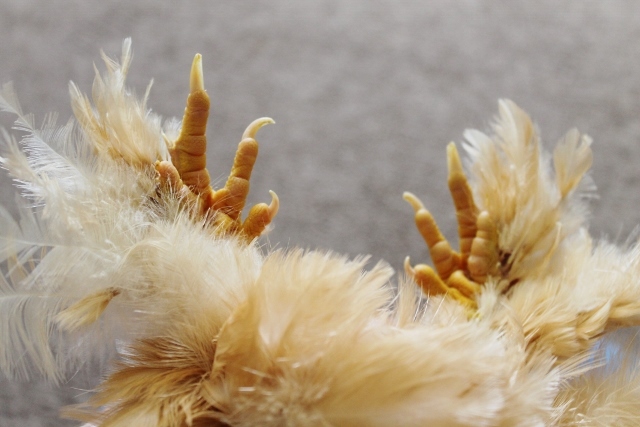 "This pullet is young, and under ready for show. 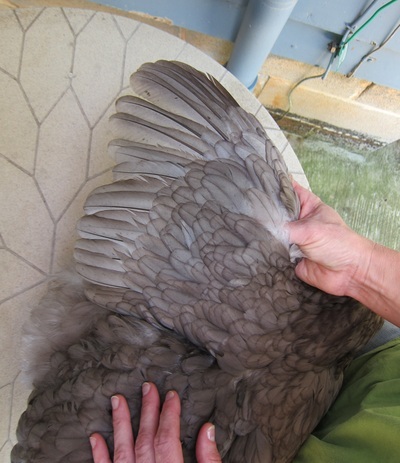 I see some roundness and good carriage of wing but most areas tend to be narrow. 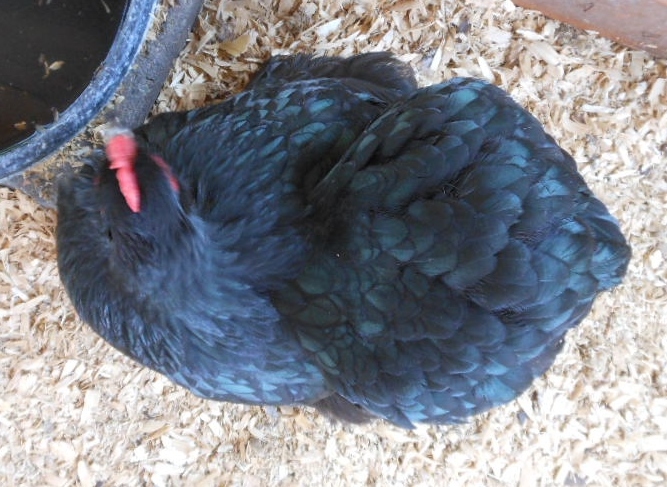 The color is overly dark, showing to much blue and even areas of solid blue making percentage ratio to heavy." 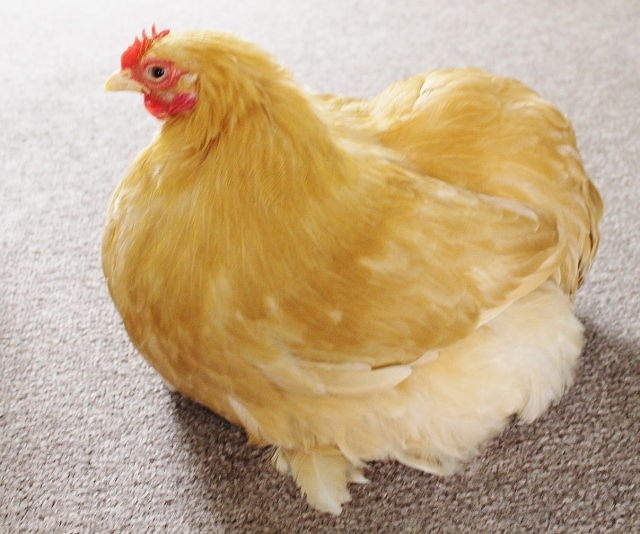 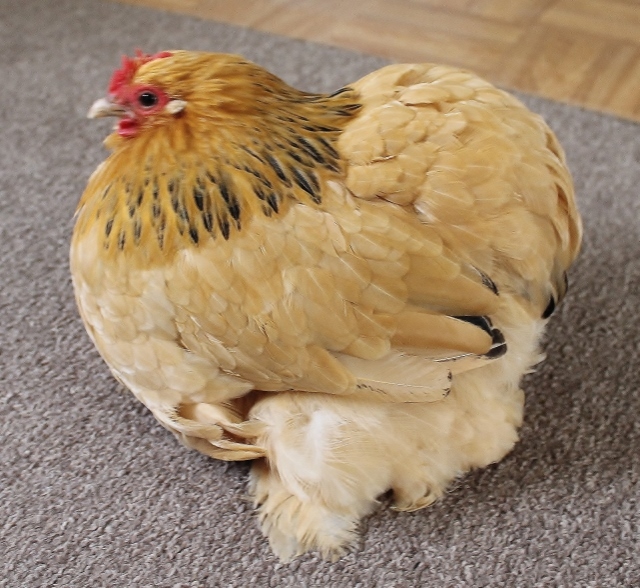 "This hen is nice, could have more width in breast and cushion, also the cushion could have a little more length. 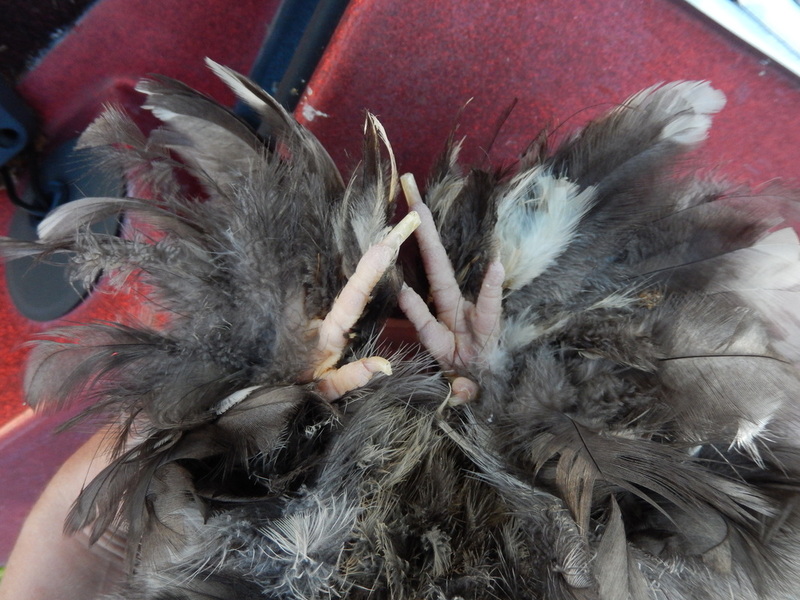 The head, skull, comb, eye and wing all correct." 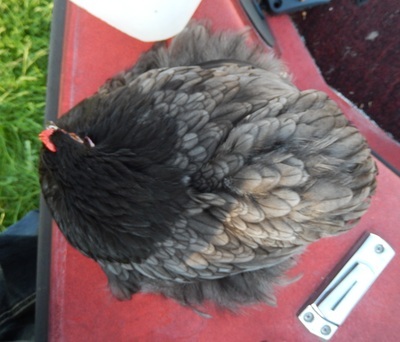 "This hen is very nice LF Cochin, nice balance and skull, nothing but strong points on the entire bird. 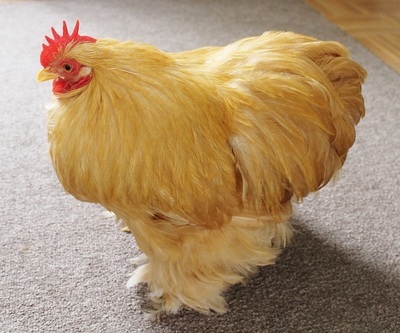 Super Nice!!!" "This male is very rough condition, needs more chest and feathering in chest area. 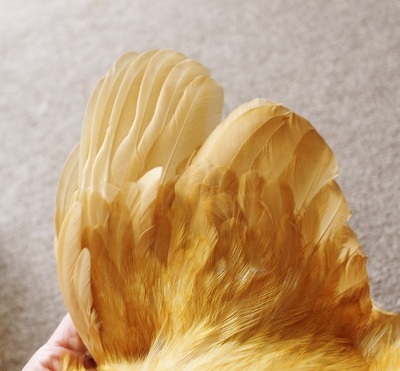 Comb very weak, badly shaped, to many spikes and rough texture. Eyes, feet and wings are correct." 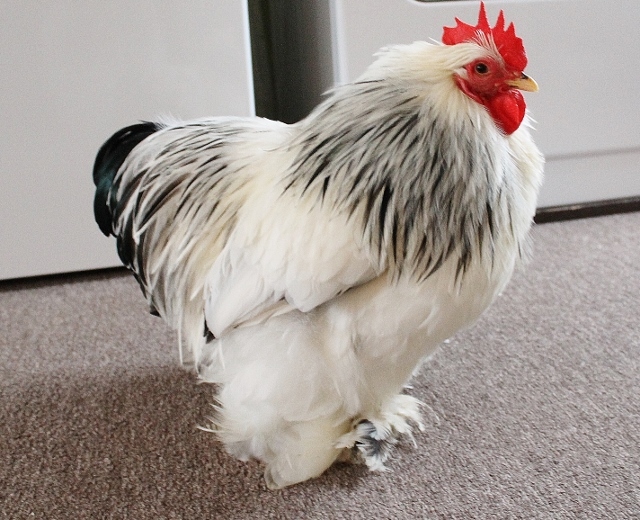 "The overall type, carriage is very good. 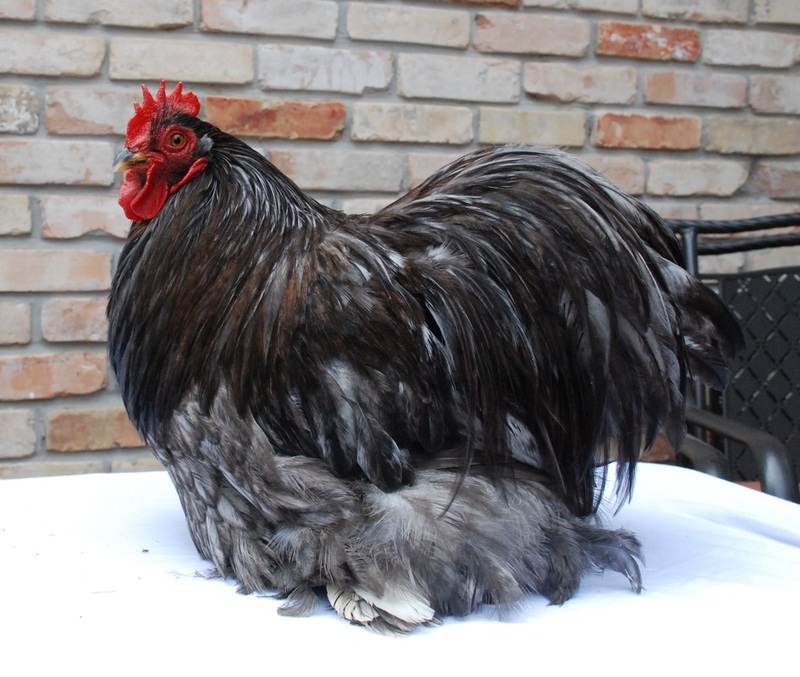 Wings are strong and carried well, eyes color is good, feet color is light be can see yellow pigment. 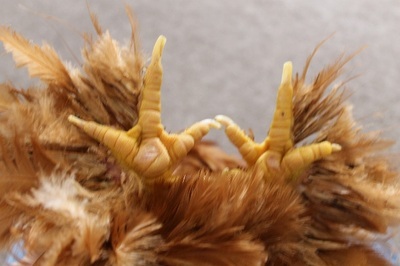 The comb and spike are missed shaped and to many spikes. 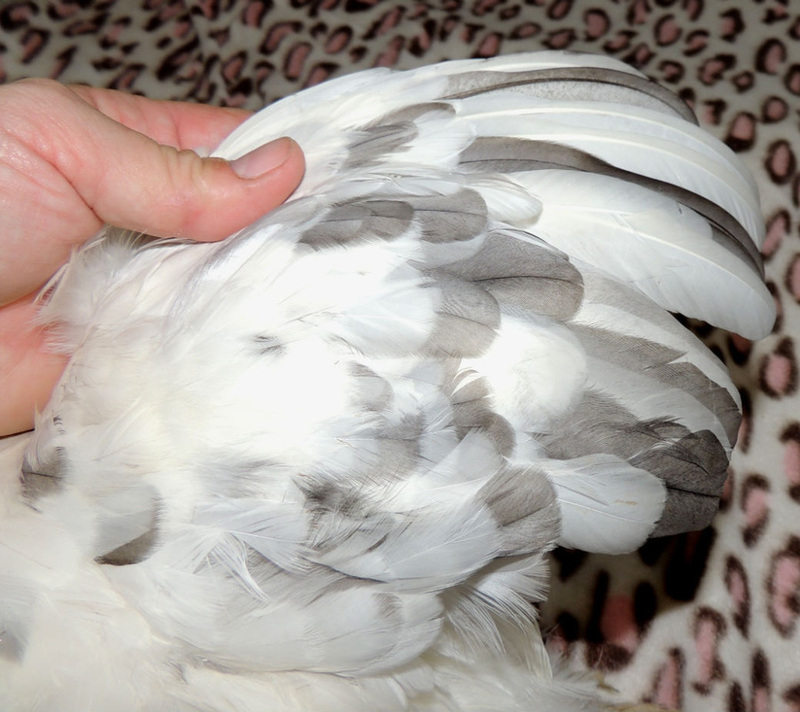 The feather color is faded and some brassiness in neck due to poor condition. 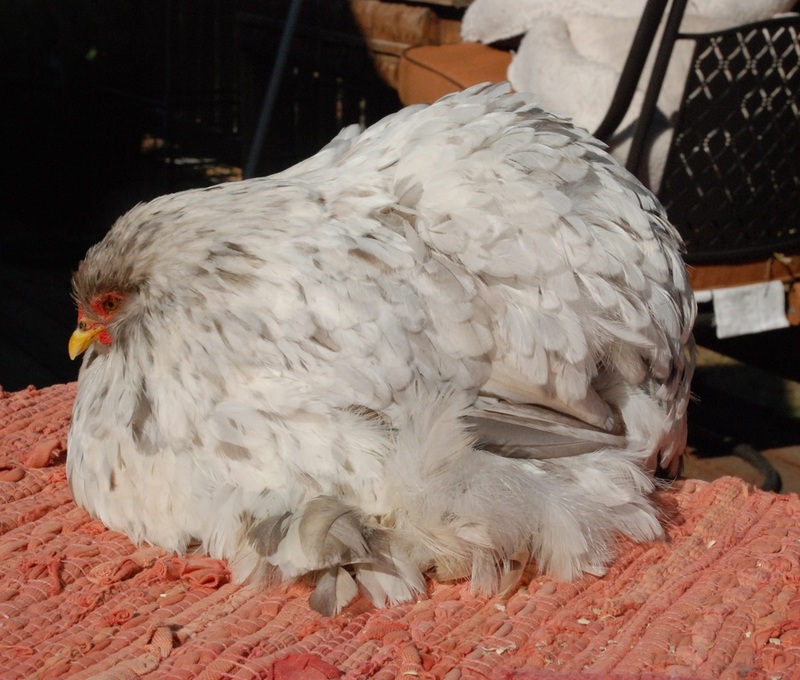 I think if she was in good feather the would be a great bird." 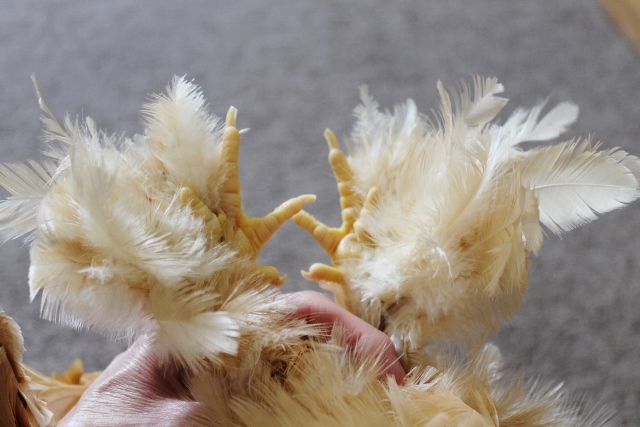 END OF ENTRIES . . . 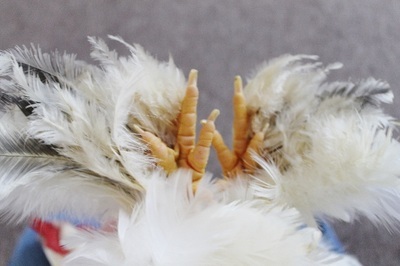 THANK YOU FOR VISITING THE SPRING ONLINE SHOW!